To receive a Canton Kayak Club membership card and the combination for the locks that secure the kayaks and gear, I had to complete 3 1/2 hours of training, which I did yesterday. But not as expected. 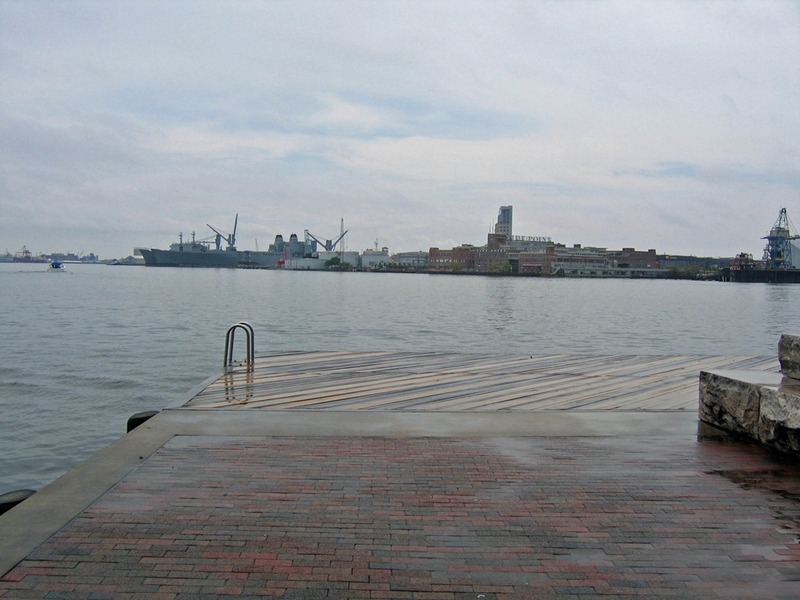 When I arrived at the training dock, it was cloudy, 52 degrees, and windy. 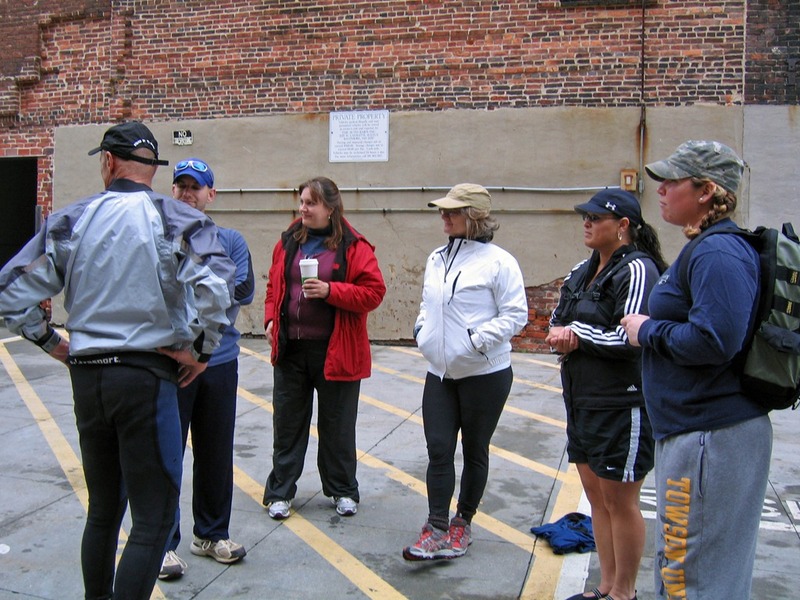 To start the class, our trainer had us move away from the dock into a parking area. There were six people in the class, five of whom could have been my grandchildren. I was the ancient kayaker. Our trainer was Rick. We began at 12:30 p.m.
After we introduced ourselves, he quizzed us on the club rules and we had a Q & A discussion. It began raining, so we moved under cover, where the wind blew relentlessly. There was another class also meeting there. Here we were taught about safety, as we stood and shivered in the cold wind. By 2:00 or so we had moved to the dock, and we’d been joined by an experienced kayaker who was there to observe the training. She also helped a lot. The blue kayak is hers. The white one in the water is Rick’s. The CKC’s kayaks are on the racks. 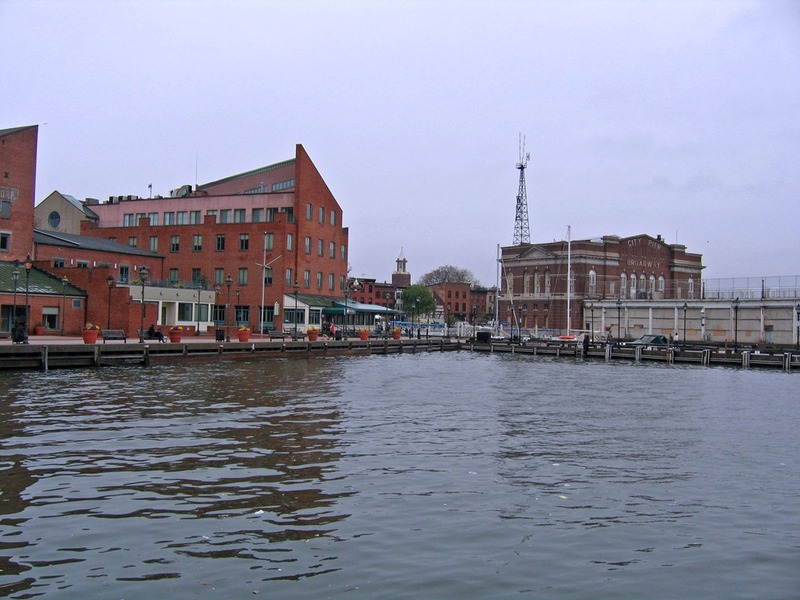 This dock is in Fells Point, where the city of Baltimore began with a port in 1726. 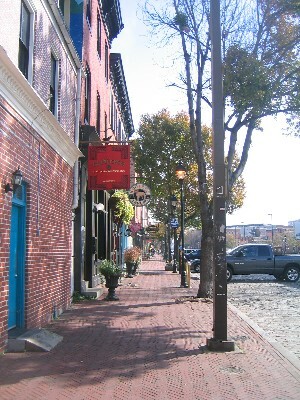 The cobble stone streets and many of the original houses and other buildings remain. Below is a view along Thames St, where the CKC has the docking station we used. 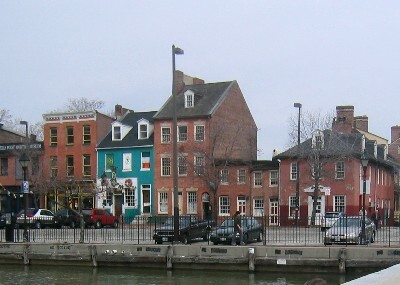 Fells Point is now a major attraction, with quirky shops, restaurants, and more bars per mile than any other place in the country. Here are some new structures that have been added to historic buildings. 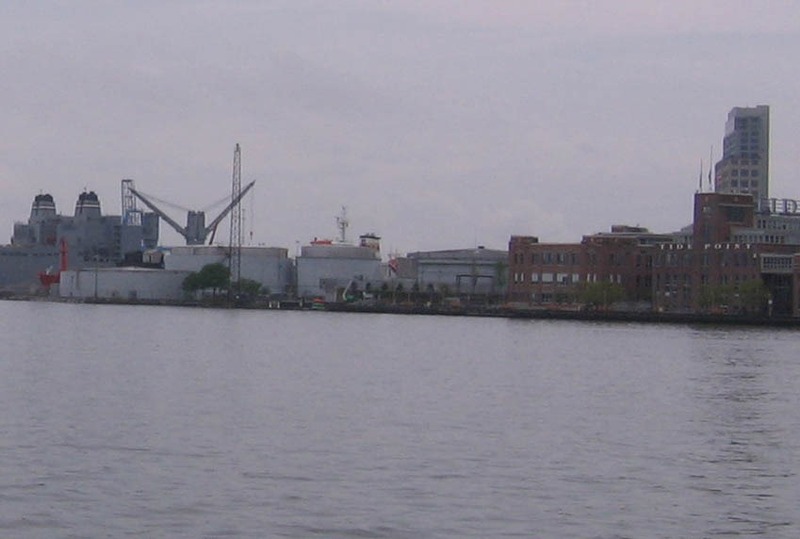 Below,the building in the background on the right is the original City Pier. Looking across the harbor you can see former factories that have been converted into office and residential developments, and some huge ships. 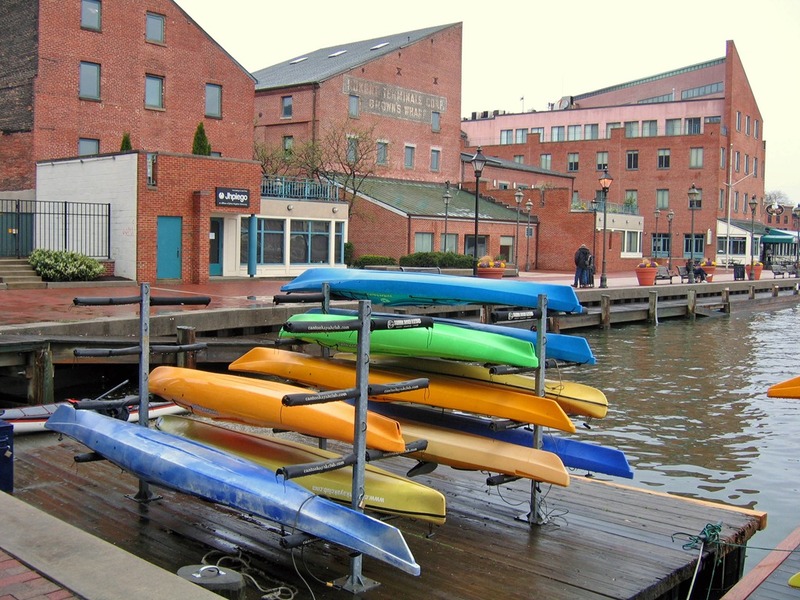 If you enlarge this shot and look closely at the left of center, you may see the Club’s other docking station with its colorful kayaks. Rick taught us the names of all parts of the kayak and demonstrated the use of the paddle and the PFD (personal flotation device, AKA life jacket). Please note in the shot the debris in the water. The harbor is unimaginably filthy. Nearly covered with trash and other visible and invisible stuff. Nasty. Then it was time for us to choose a kayak, get it off the rack and into the water, and get ourselves from the dock into the kayak. By this time, around 2:30, the sun was out, the sky was blue with puffy white clouds. 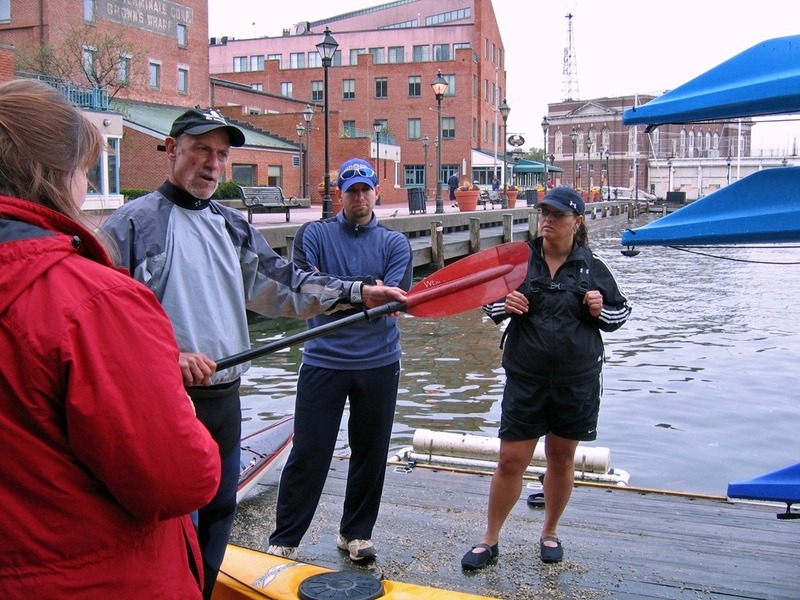 It felt wonderful to be on the water, and I was paddling and maneuvering as instructed. But after 30 minutes or so, I was done in. Information overload. Too many instructions to take in and execute. Moreover, the sun was getting to me. I had left my hat in my bag. 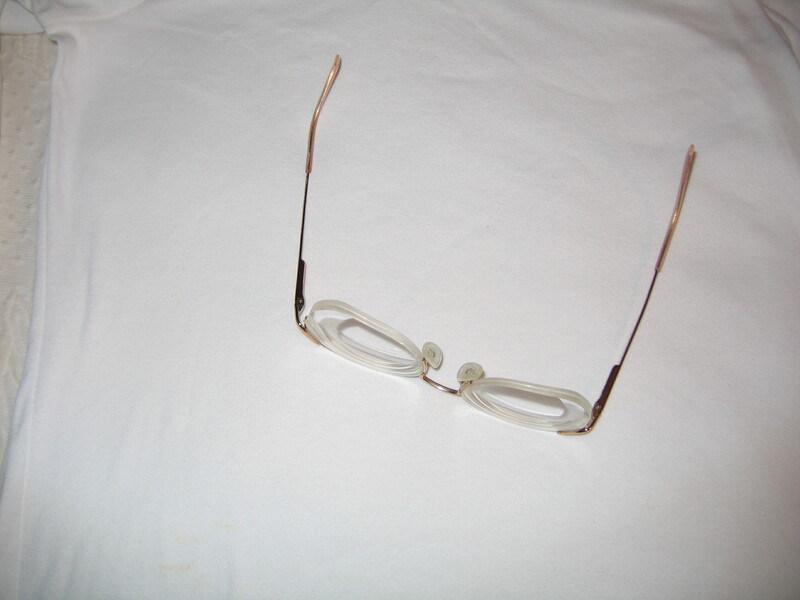 I had put my glasses with slip-in sun shields into my pocket for safe-keeping. I was tired and mentally fatigued. I told Rick I needed a time-out and I paddled into the shade near the dock. But when Rick summoned all six of us to gather around his kayak for further instruction, I joined them, I was afraid that if I didn’t complete the training, I would not be able to use the kayaks. He told us to line up in front of him. 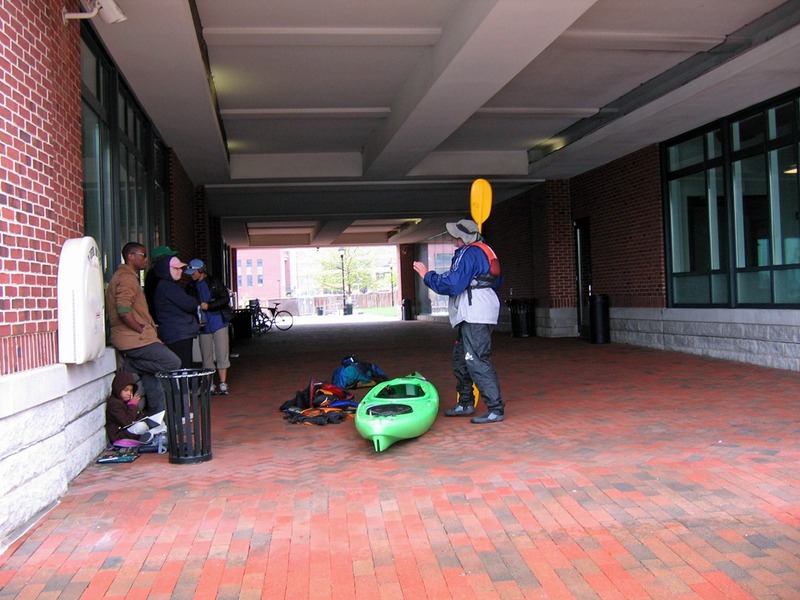 As I approached the end of the line, the other class members were holding on to each others kayaks. I reached for the nearest kayaker’s hand and capsized—into that 50 degree filthy water. Nick had to turn my kayak over and coach me into getting back into it. I stupidly continued with the next instructions for another 20 minutes. Soaking, sopping wet, my shoes filled with water, I tried to follow the demonstration Rick was giving me for “slicing” with my paddle. I wasn’t getting it. I knew I was beyond my limit and couldn’t absorb any more information, but I tried. This time I had to be pulled out of the water on to the dock. I hadn’t the strength to get back into my kayak. There I stood, trembling, for the time it took to get all the kayaks back on the racks and secured, to be shown the combination lock and given the combination, then handed my membership card. I had brought a towel with me, but all I could do with it was to get some of the water off my head and to dry my glasses, which had become bent but not broken. It was 4:00 p.m.
My car was six blocks away. Another trainer offered to drive me there. I drove home (25 minutes), still drenched and dripping, still trembling, and unable to see clearly because my glasses were askew. Even after 20 minutes in a hot shower, I was still trembling. Was it from the cold, from the shock of the experience, my “usual”tremulousness after some kinds of situations, or all of the above? I didn’t stop shaking until 7:00 p.m.
With old glasses, wrong prescription, but cheerful anyhow. Today I am aching all over my body. But I am no less enthusiastic about getting on to the water in a kayak—without six people around me and instructions being shouted at me. Though ancient, I’m sure I can be a kayaker. Yesterday I joined the Canton Kayak Club. This club has kayaks at six different docking stations with paddles and life vests. 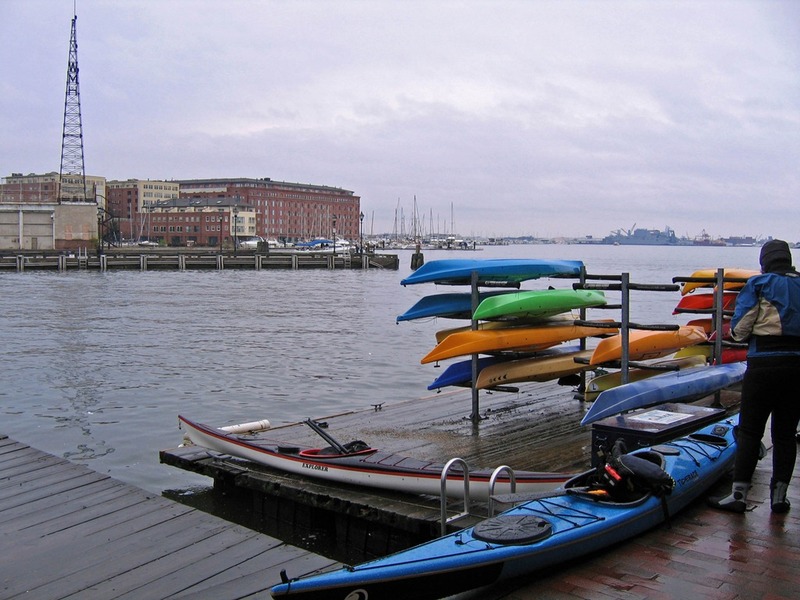 Members can use these kayaks at any of the stations at any time, after being trained. 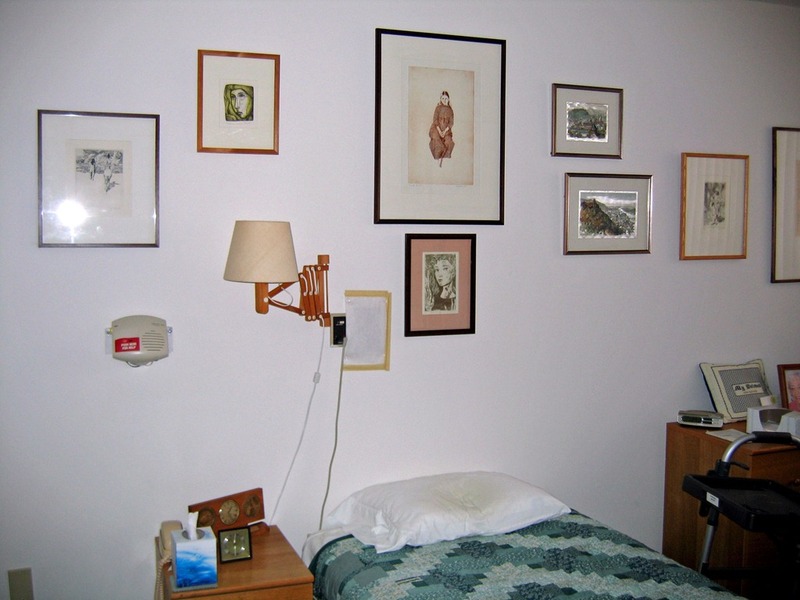 Here’s one of the stations I am likely to use. 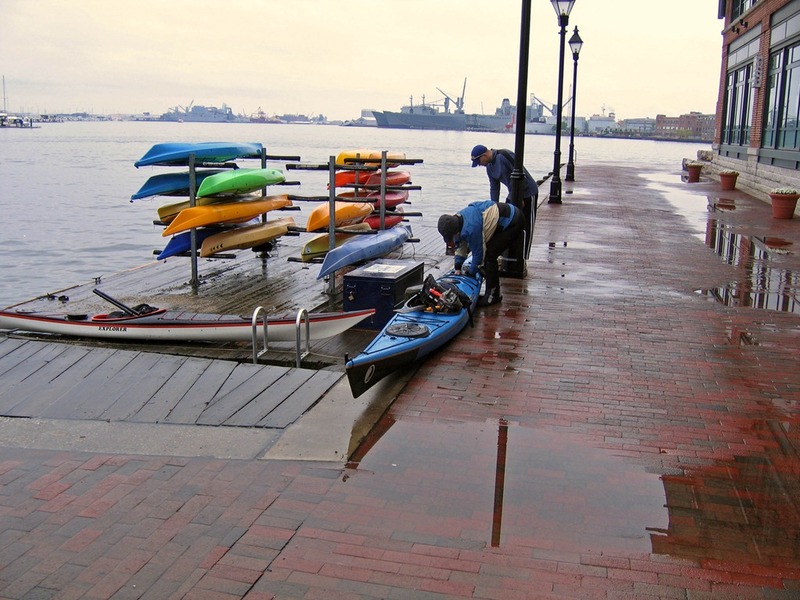 It’s easy to park there, not far away, and not in the crowded Inner Harbor. There are lovely inlets and branches to explore from here. You may remember that last August son Michael took me kayaking. 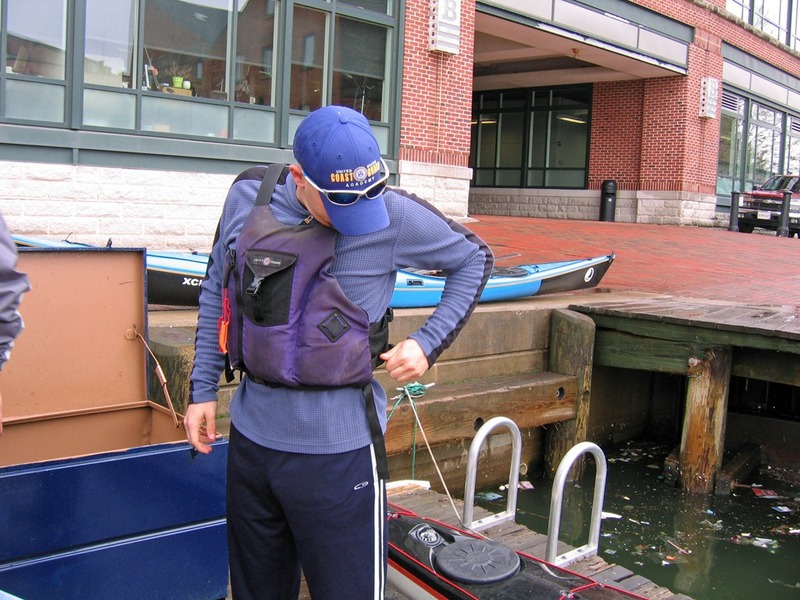 Here’s Michael unloading his two-person kayak. It was around 7:40 on a perfect morning and not another person to be seen. This is what we saw from the kayak. You can see how still the water was. The only sounds were birds and insects and our paddling. It was wonderful. Shortly after that experience I woke up with the conviction that I had to own a kayak. I couldn’t just wait for Michael to take me out once in a while. I wanted to be able to be on the water whenever I wanted to. I began researching kayaks online. 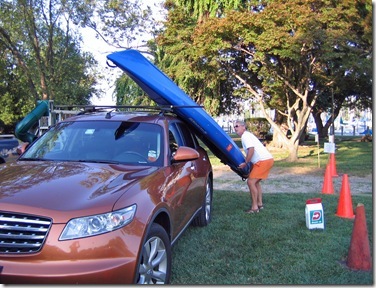 There are inflatable kayaks that I could keep in the trunk of my car. After Michael firmly nixed that idea, I began thinking about how and where I could keep a real kayak. Back online I went, not sure what I was looking for, as there didn’t seem to be a way for me to own a kayak. 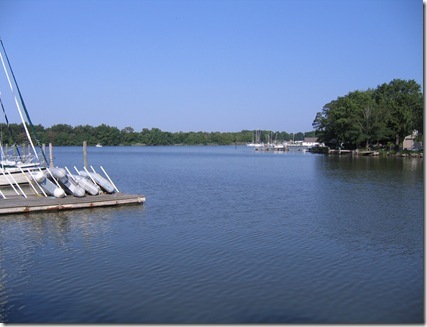 This time my search showed me the Canton Kayak Club site. By then it was September, close to the end of the season. I’d have to wait until the 2011 season to learn more and decide whether to join. But I did drive to each of their docking sites to see whether I’d want to be there. Watching their website, I saw that they were having a season opening event on April 21st, interested people welcome. Even though I was scared and nervous, unsure I really wanted to do this or that it was a good idea, that’s where I was last night. As I drove through downtown from the West side to the East side at 5:30 p.m. in rush hour traffic (no rushing, mostly sitting and waiting), I calmed myself by imagining telling people that I belong to the Canton Kayak Club. It’s the first time I’ve been in this kind of bar setting since 1991. 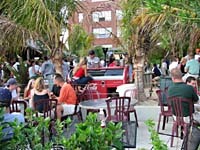 It’s right on the waterfront, with lots of outdoor seating, too. 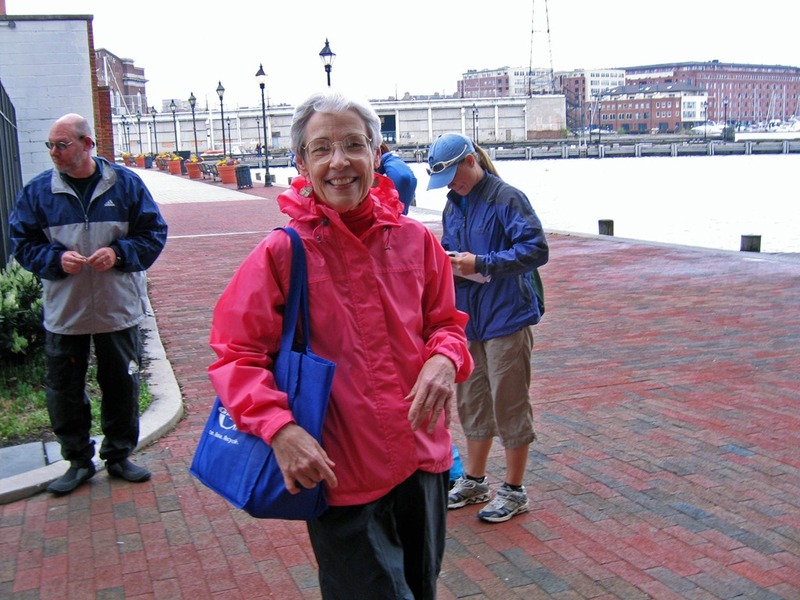 I almost fled: the bustling crowd of young people, with the deafening noise even after I lowered the volume of my hearing aids, was overwhelming. I wasn’t even sure how to get a drink. Another of my “firsts” since recovery. As I stepped up to the bar with my ticket for a free drink as a new member, a man seated there told me I’d better have my ID ready. ID? Did I need a membership card to show? 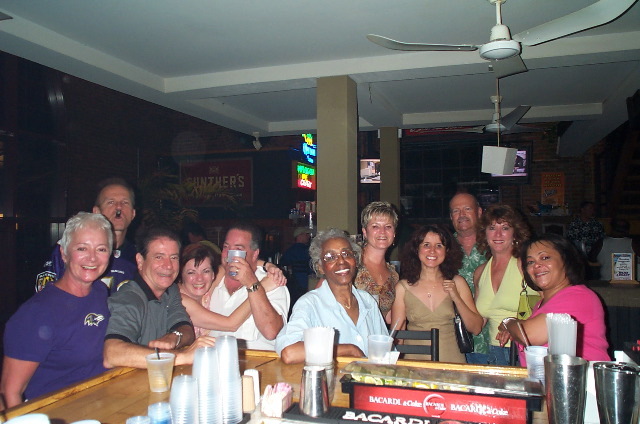 Then I got it–he was saying I should expect to be carded–little old lady that I am! I should have told him I didn’t know I looked THAT young! Although I didn’t want to stay, I couldn’t leave. I’d told too many people-who-matter that I was going to be there. I had to stay and decide whether to join. Fortunately, I saw a small, slender woman with a little gray in her hair. I introduced myself and asked if she was a member. “Oh, yes, for many years.” “Can you get the kayak off the rack, into the water, and back on the rack by yourself?” I asked her. She said she usually goes with a partner, but that she can handle the kayaks by herself. That was key information for me, as I want to be able to kayak by myself, early in the morning. I decided to join. Upstairs where they were serving a buffet of finger food, I signed up for training–tomorrow! 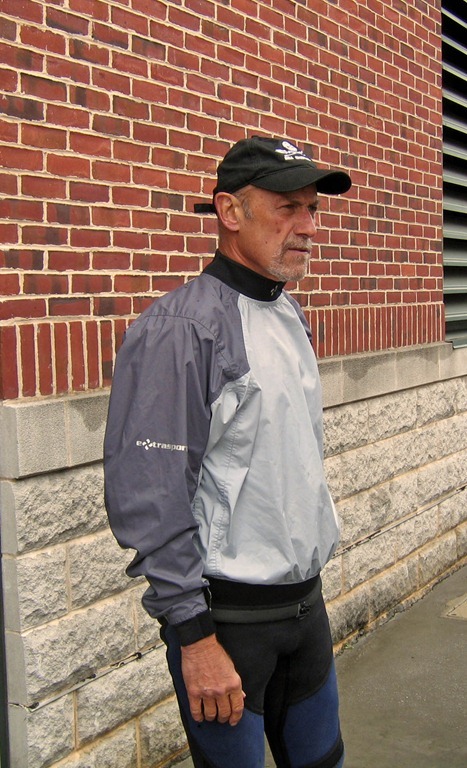 And then I saw a really gray-haired woman, about my age. After commenting that there weren’t many of us here, I asked if I could talk with her. “Please do!” she said. “I was afraid there would be only 20-somethings here.” Turns out she has kayaked all her life, including at Tierra del Fuego. And she kayaks alone. Ah, if she can do it, so can I. We exchanged contact information. The closest docking station is about 12 minutes from here. And I was told that there are small kayaks there and that it is easy to get them into the water from this dock. All the stations are co-located with eating/drinking places. 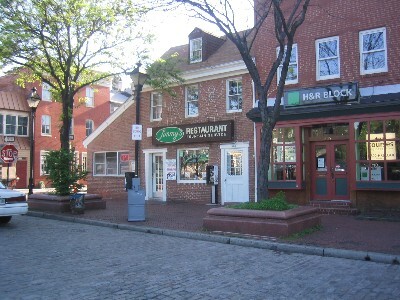 This one is at Nick’s Fish House, where there’s plenty of parking and probably no one in the parking lot at 7:00 a.m. This will most-likely be my “home” dock. Weather permitting (a thunder storm is forecast) I’ll get training tomorrow, my membership card, and the key code to access the kayaks. Then, a-kayaking I will go. 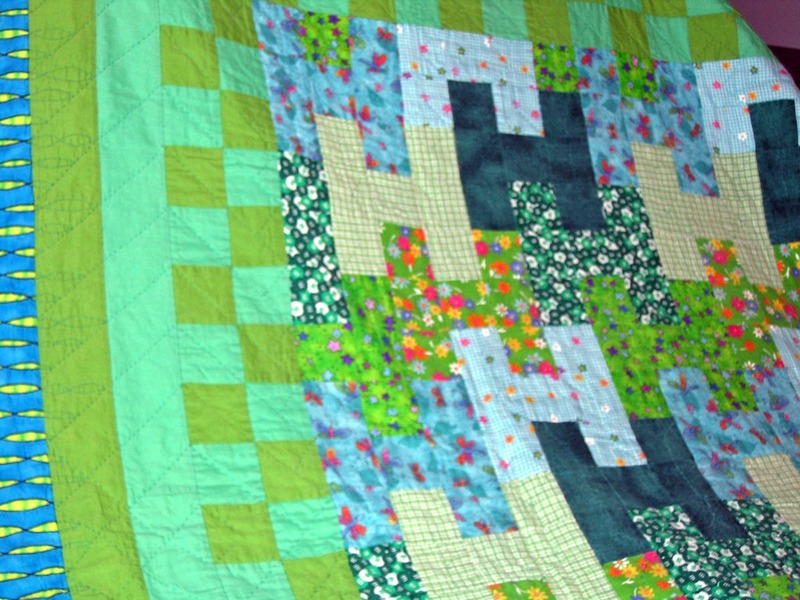 In this detail, you can see the heart-print fabric and ribbon included in this quilt. 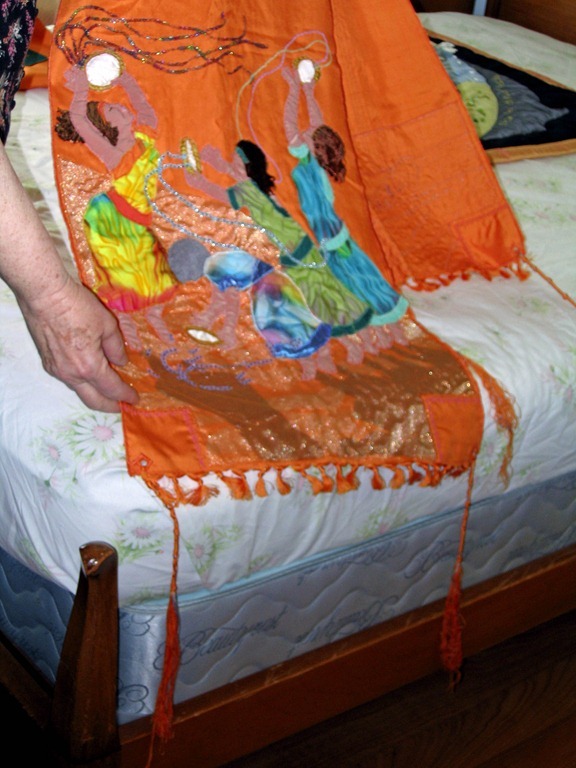 Below is the label on the back of the well-worn quilt. 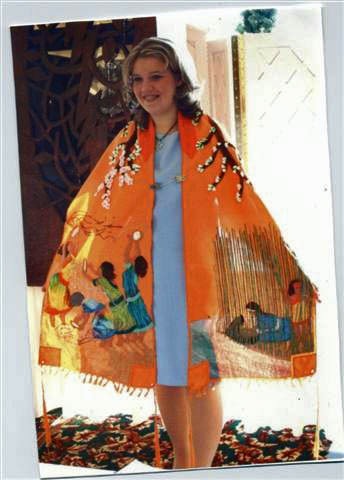 Next came her entry in the Hoffman challenge, an annual event in which people are invited to submit textile art using a particular Hoffman print fabric. Here’s the print with which Deb worked. She described it as hideous. 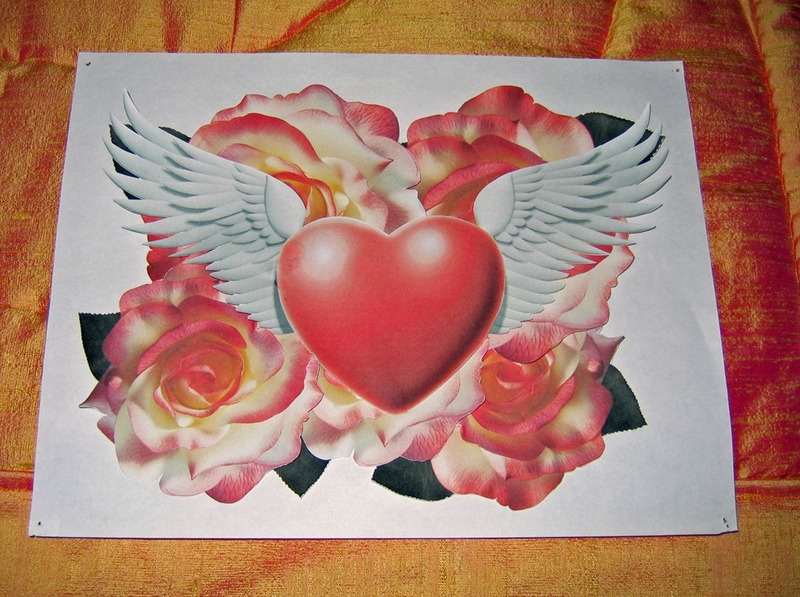 But after she had cut it up and pieced it in her own design, it looked like this. 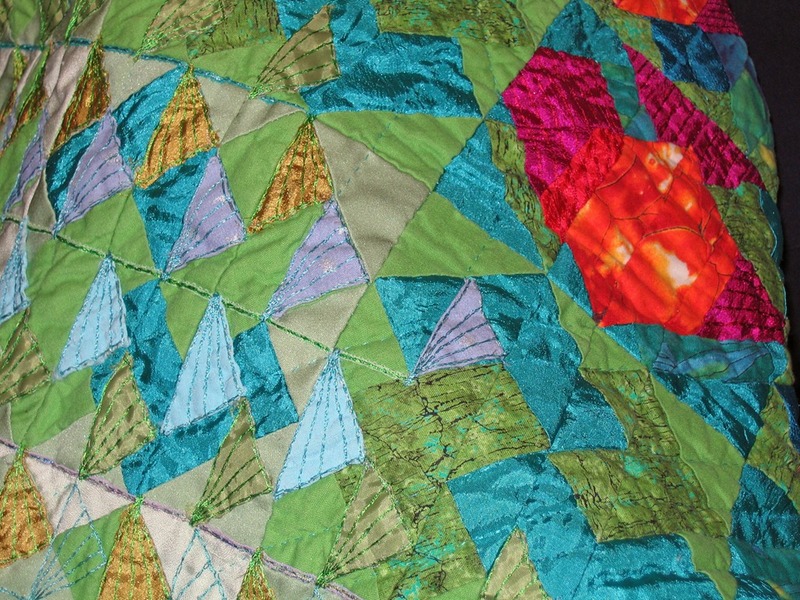 In this detail you can see the hand stitching she added for texture and to modify the colors. Here’s the label on the back of the challlenge quilt. 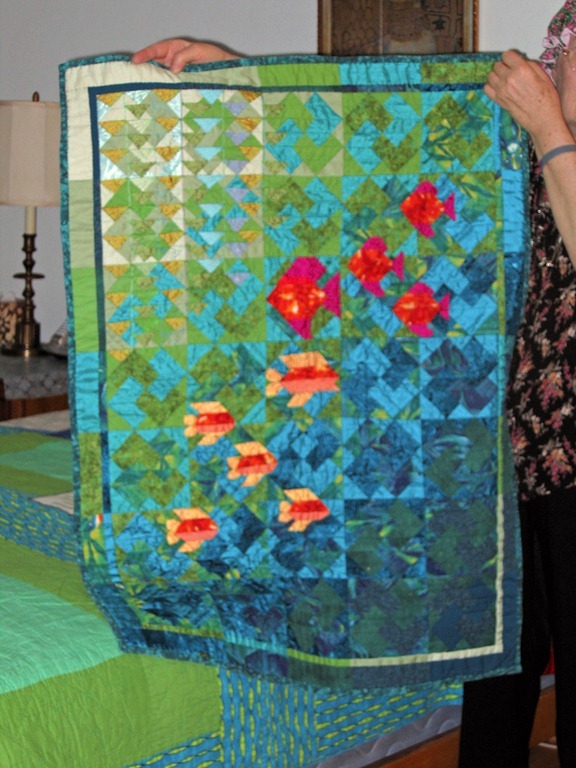 Next she showed us the H quilt she had made for granddaughter Hannah, whose favorite color is green. Notice the interlocking “Hs”. 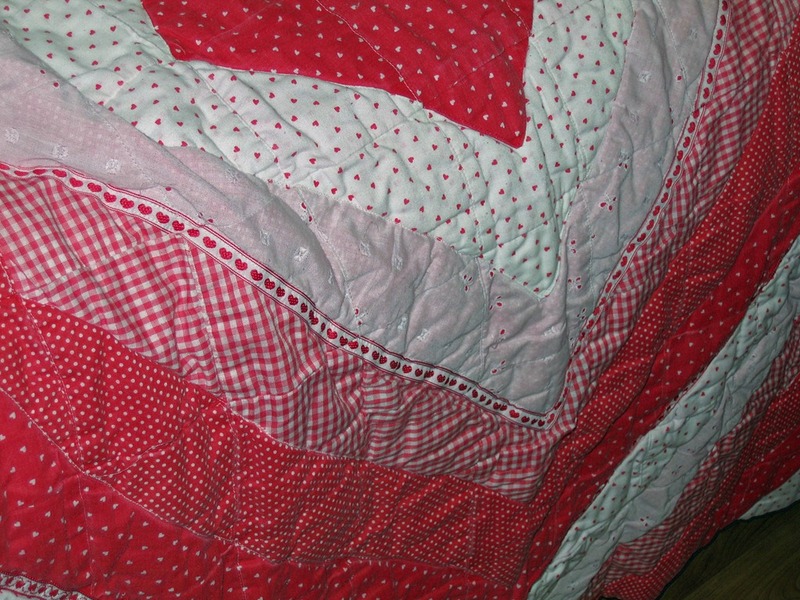 This is a double-bed size quilt. 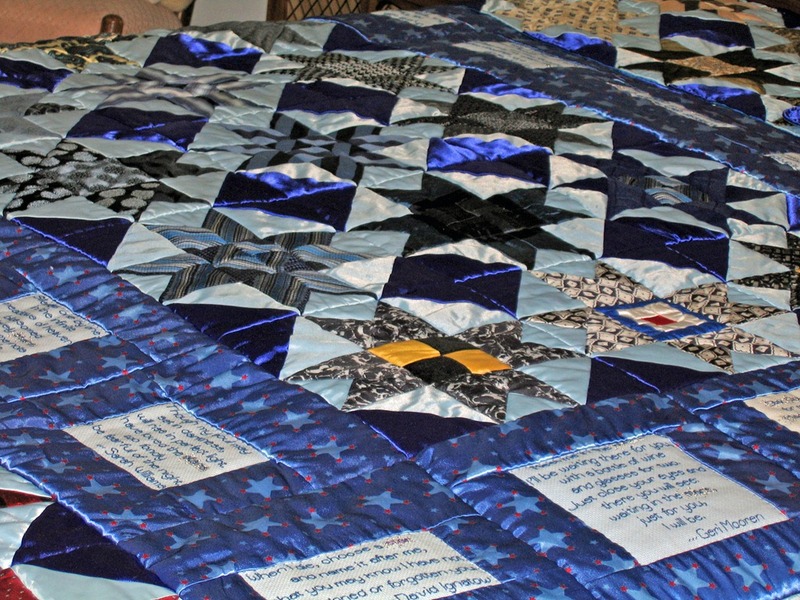 I could not get far enough away to photograph the whole quilt. 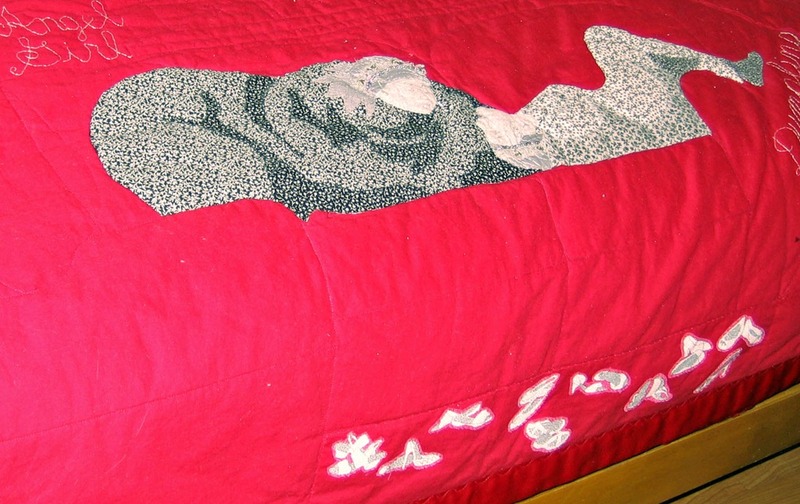 Then came this gorgeous full bed quilt made with neckties. 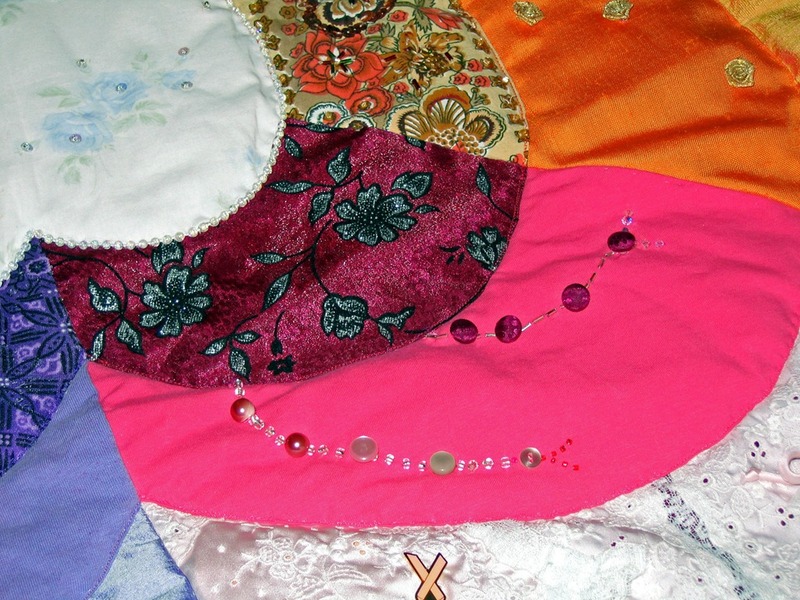 When Deb’s sister’s husband died, he left a huge collection of neckties, which the widow wanted to use as a quilt. 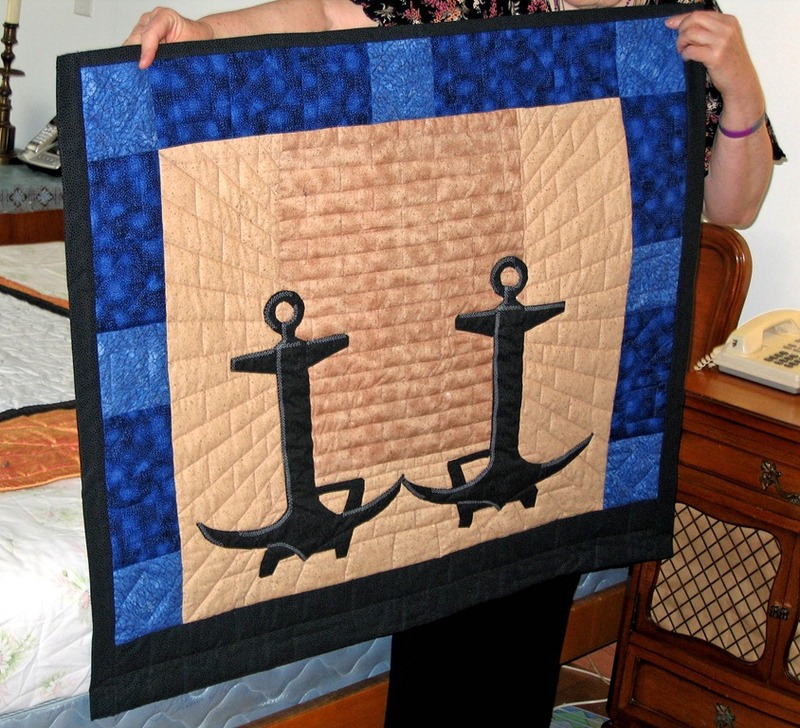 Never having made a quilt, she sought Deb’s advice but she simply couldn’t do it. 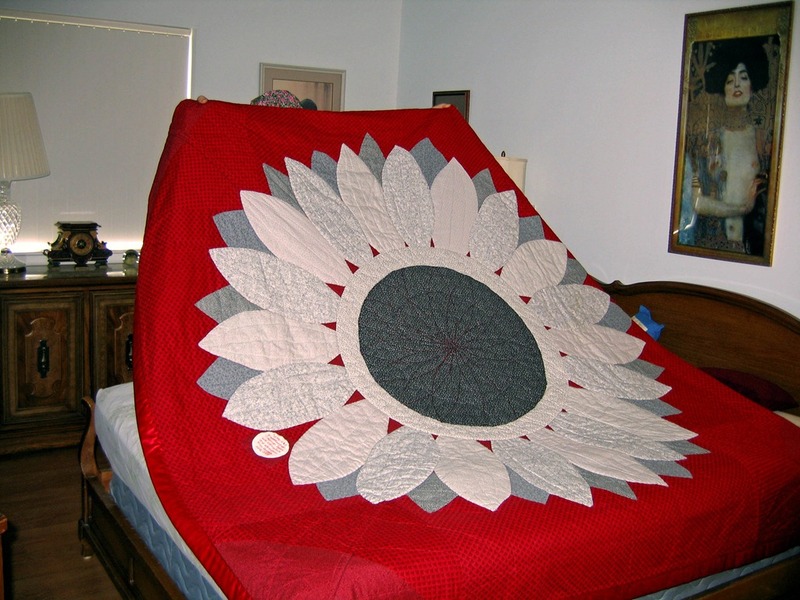 Finally Deb, who had not wanted to take away this grief-work from her sister, delicately asked whether she would like Deb to make the quilt. 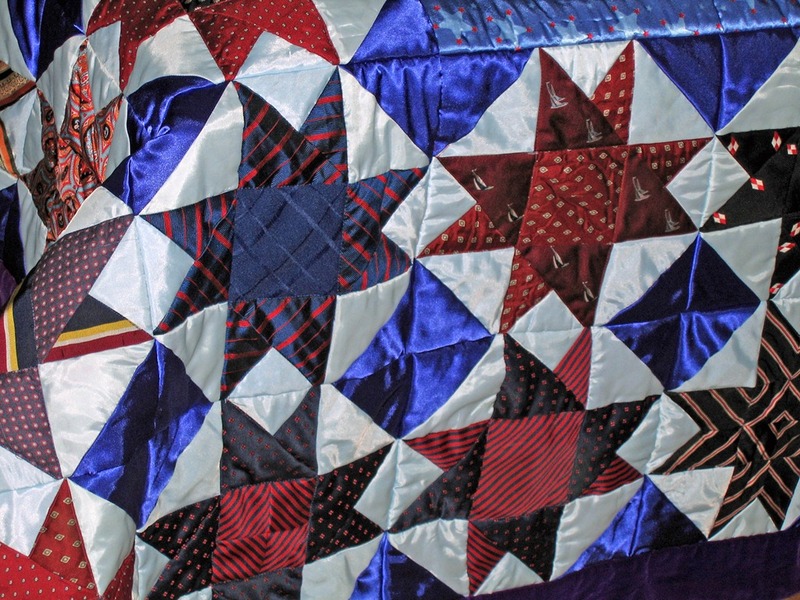 Her sister said, “I thought you’d never ask!” To the 100+ neckties sent to Deb, she added some blue and blue star-printed material—all silk. And she found scores of poems about stars which she sent to her sister, who chose ones she most liked. 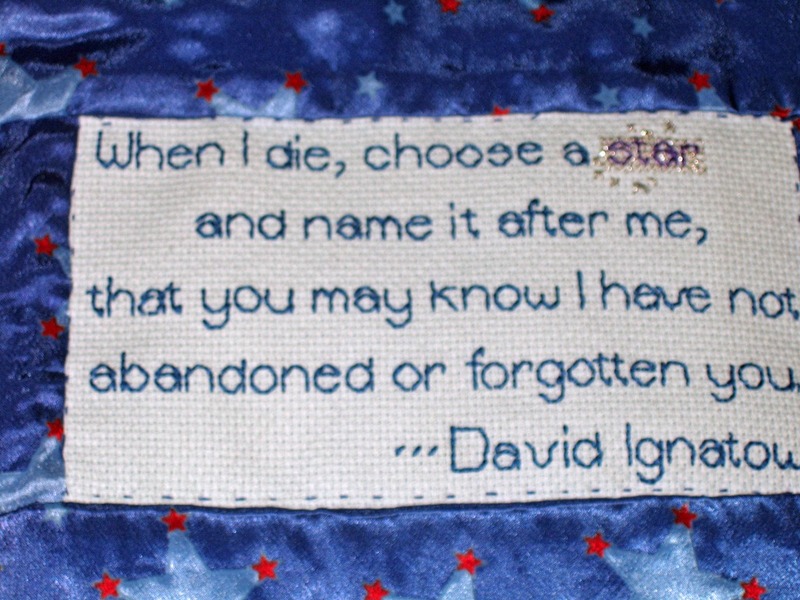 Deb embroidered these poems as part of the border. 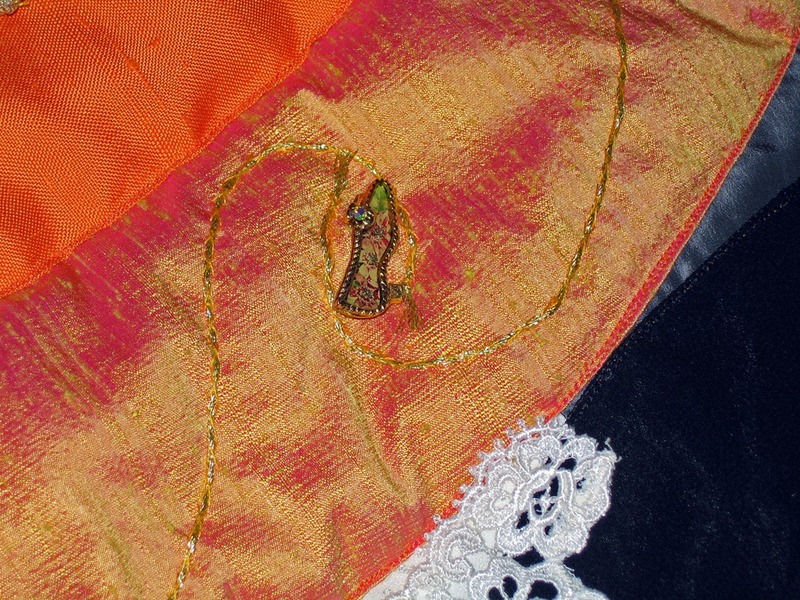 In this close-up of a corner of the quilt, you can recognize the tie silks. 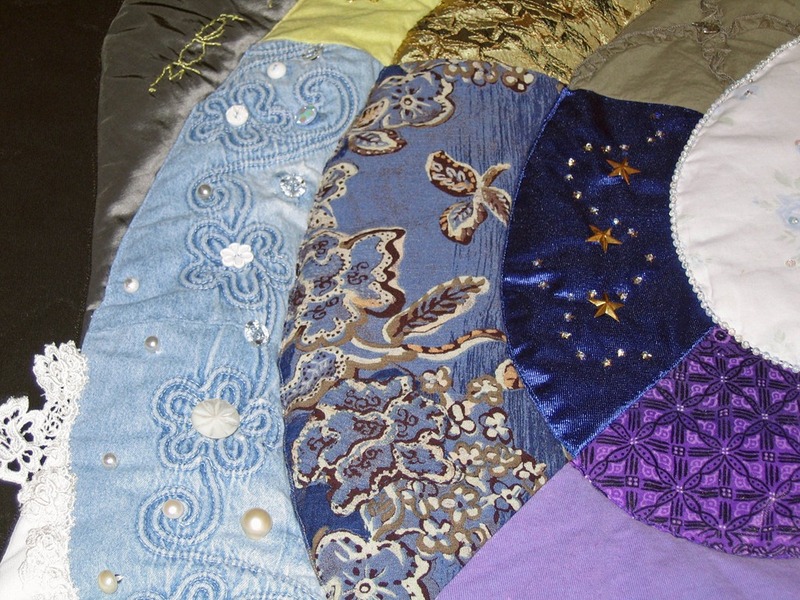 Each time the word “star” appeared, Deb highlighted it with metallic thread. 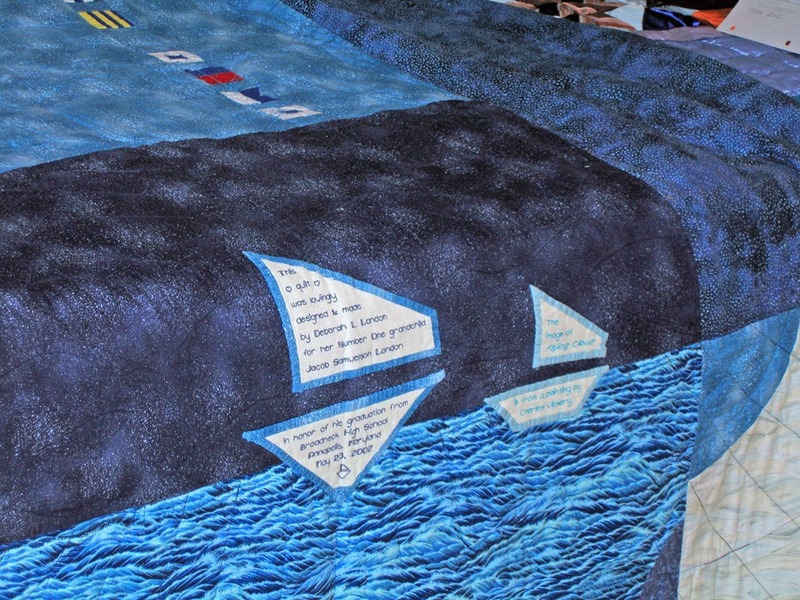 After that we saw another large bed quilt made in celebration of her grandson’s high school graduation. Like my own sons, he’s been sailing all his life. 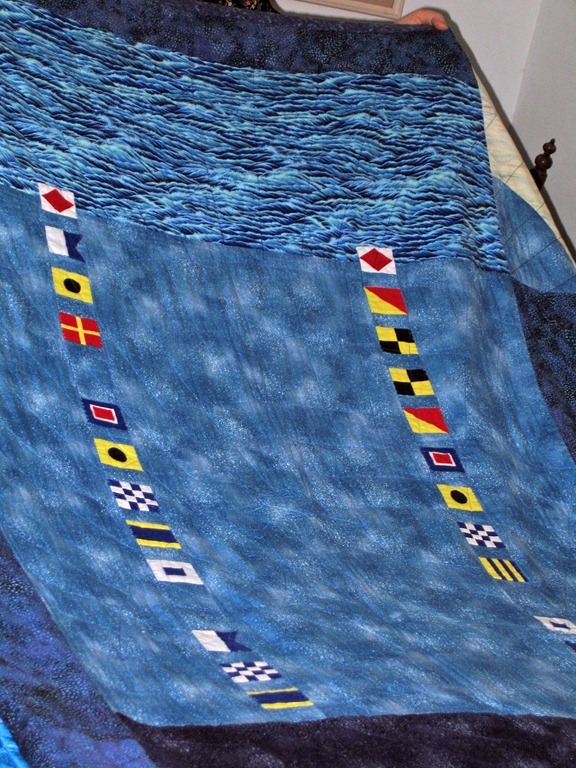 Because I had my camera on the wrong setting, I failed to get a picture of most of the quilt, but I can show you the central motif—an historically accurate representation of a sailing ship, worked after much research. 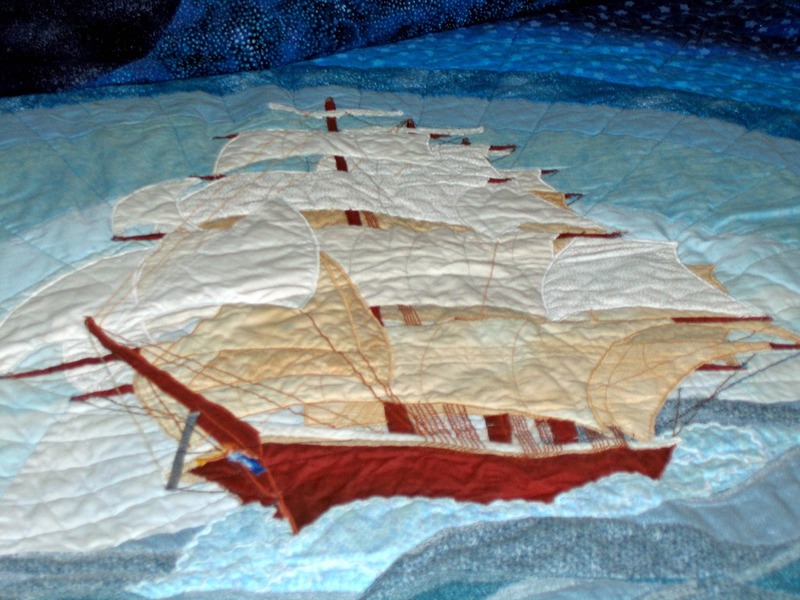 All the details of masts, sails, and rigging are correct. There were waves below and a starry sky above. 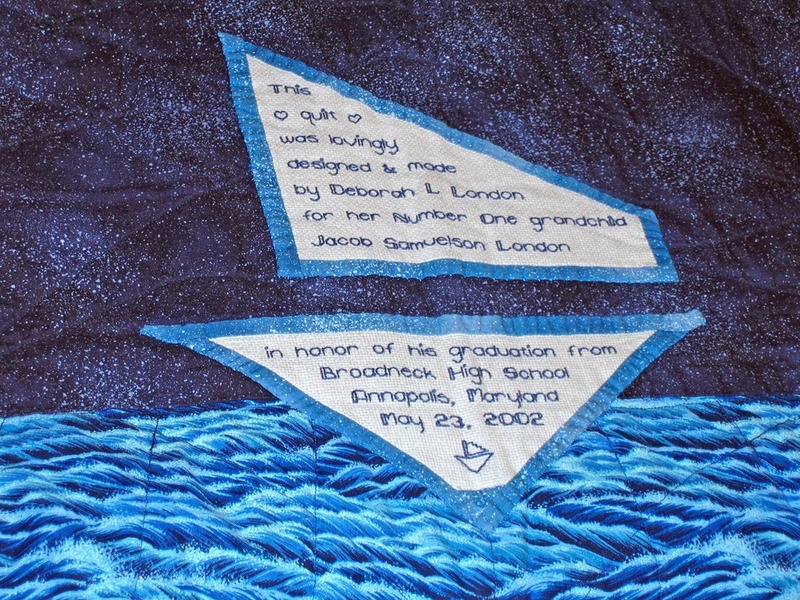 On the back of the quilt Deb had created two little sailboats to carry her words. Here she credits the source of her image. 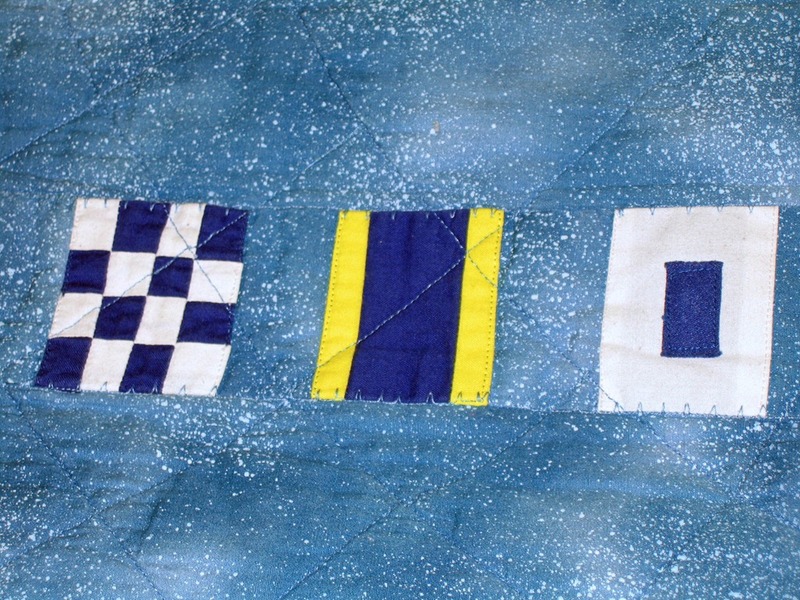 Also on the back of the quilt is a message in semaphore. 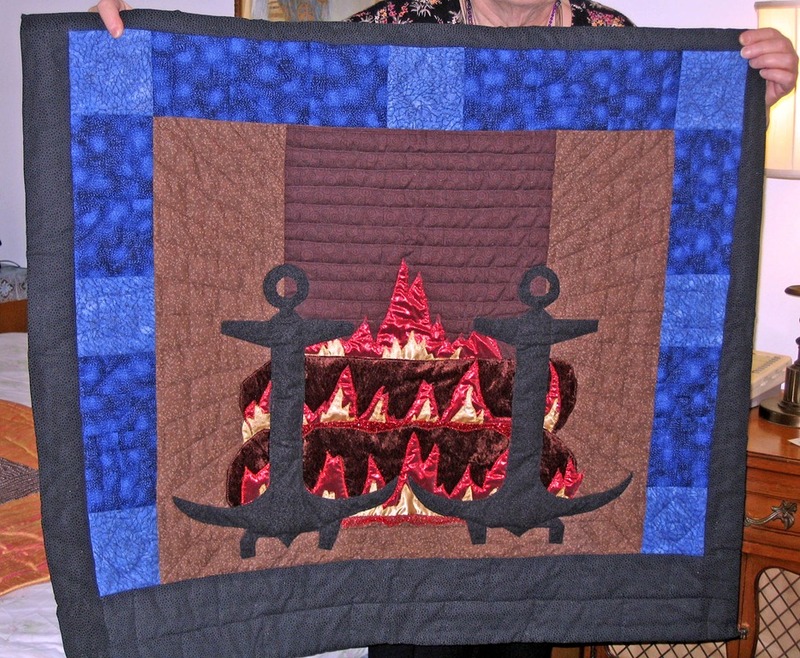 Since the edge of the fireplace is iron, Deb put magnets on the backs of the quilts. They hug the fireplace smoothly. 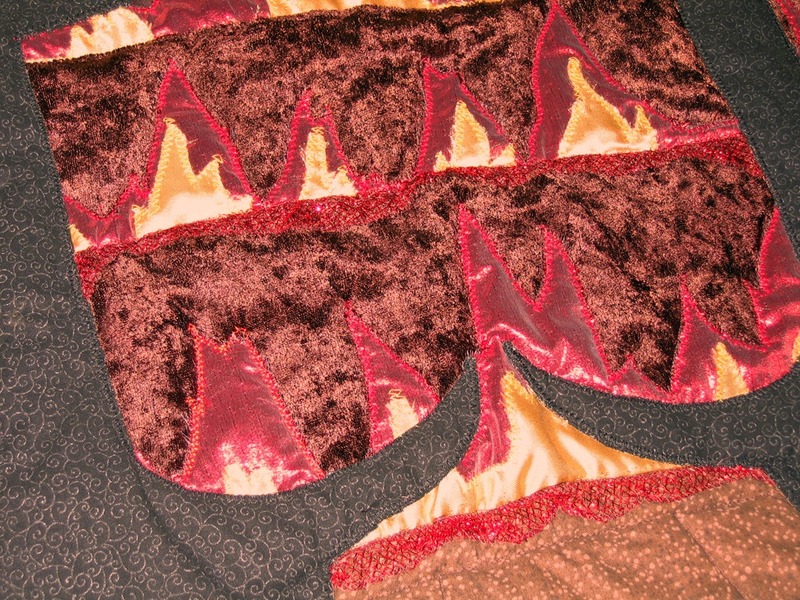 Here’s a detail of the fire, made with satiny shiny and metallic fabrics. 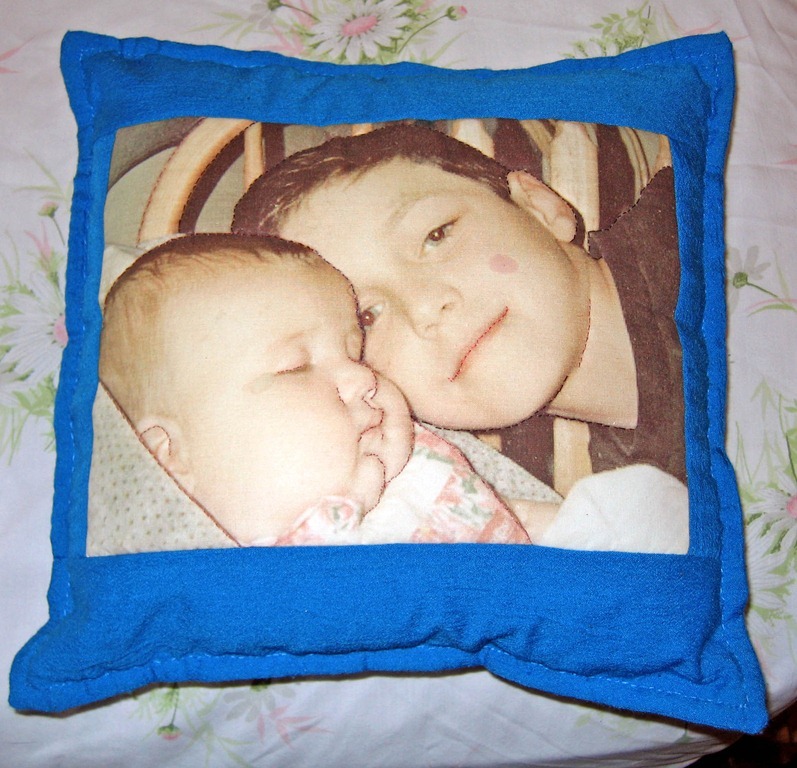 For the son who had no use for a quilt, Deb made this little pillow. 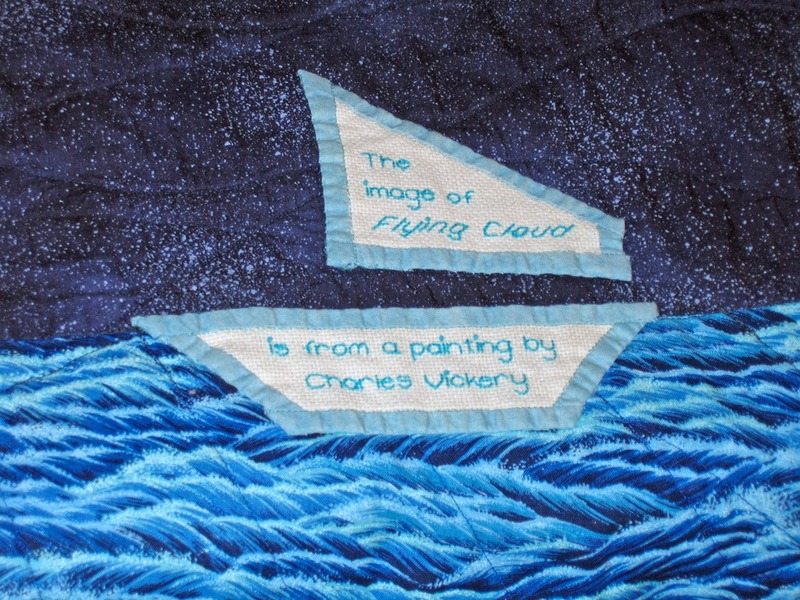 She printed a photograph of his children on fabric, then used tiny straight stitches to outline some of their features, creating the illusion of three dimensions, In fact, the baby’s nose is actually dimensional. 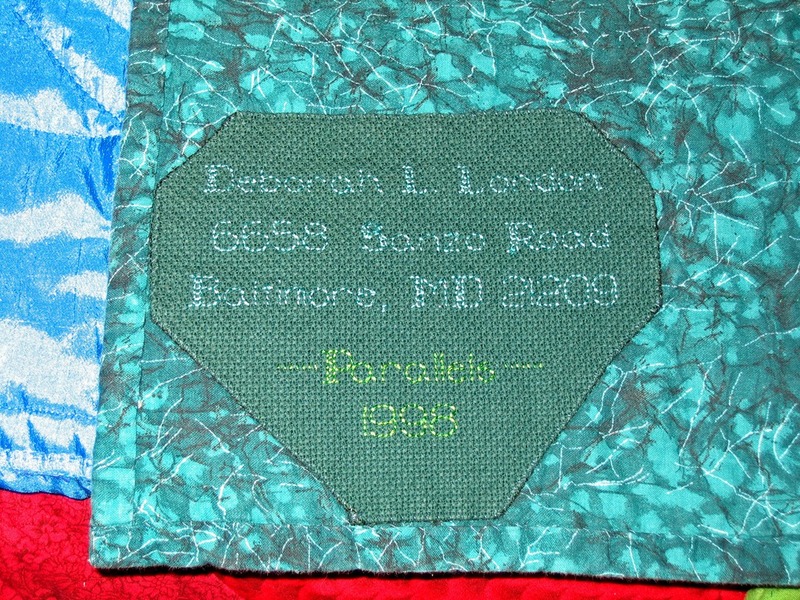 Another pillow was made from a paper collage Deb created and photographed or scanned into her computer, then printed on fabric and stitched to outline. 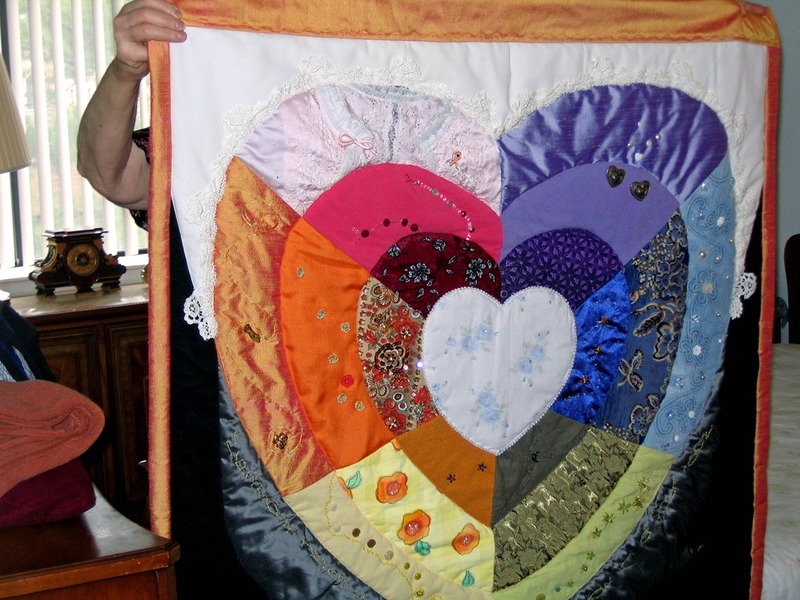 After Hannah’s mother died a few years ago, she asked her grandmother to make a quilt in her memory. Hannah had very definite specifications. 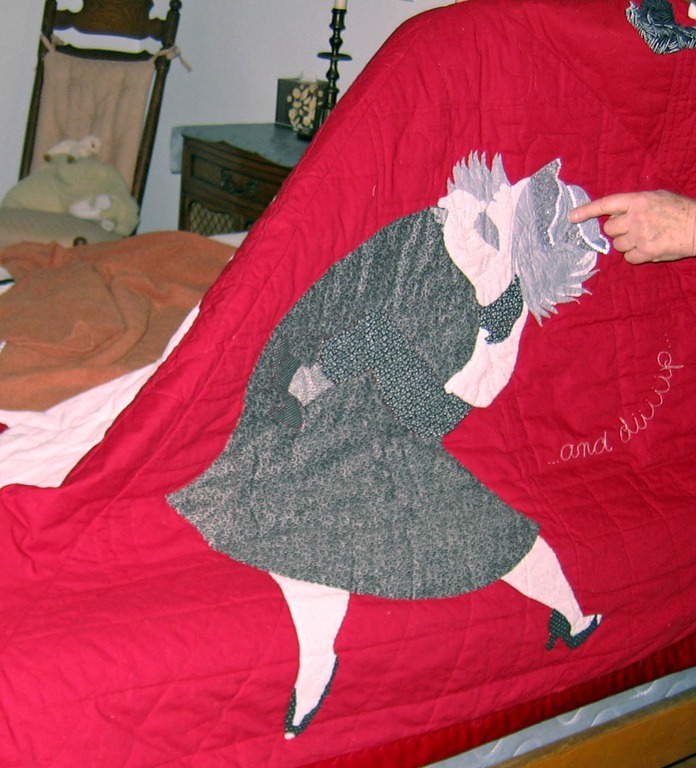 She wanted the quilt to be exclusively red, black, and white. She had some concepts she wanted represented on one side and on the other side she wanted images of memories she treasured of her mother. 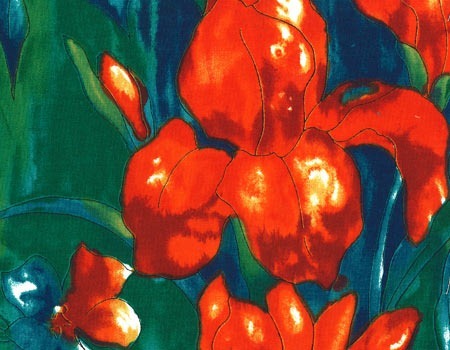 Deb rendered the concepts symbolically as a stylized flower. 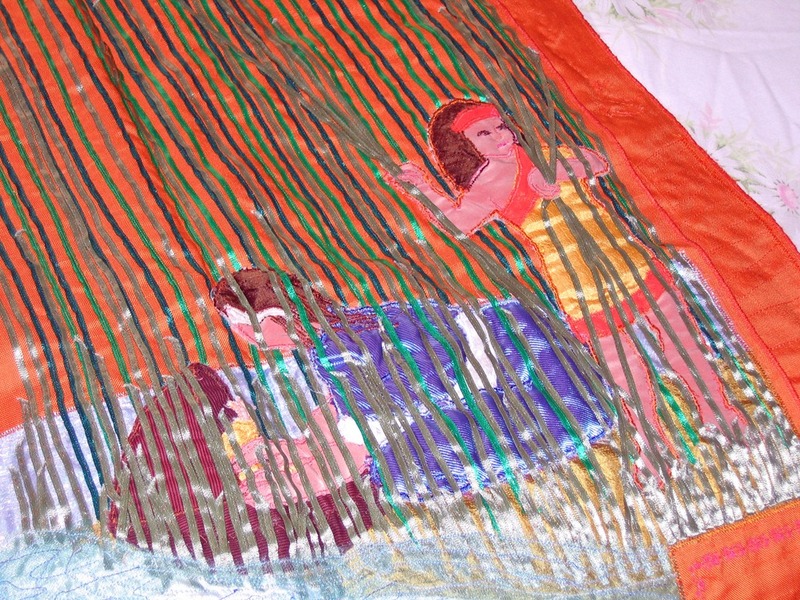 On the other side of the quilt she created four images. This one is of Hannah’s mother dancing in the kitchen with Hannah in her arms. Deb’s finger is pointing to the tiaras worn by mother and daughter. In this close-up you may be able to see the joyful expression on Hannah’s face and her mother’s high-heeled shoe she is wearing. Another memory of playing with her mother, wearing the tiaras again. Beneath are shoes, which both of them especially liked. 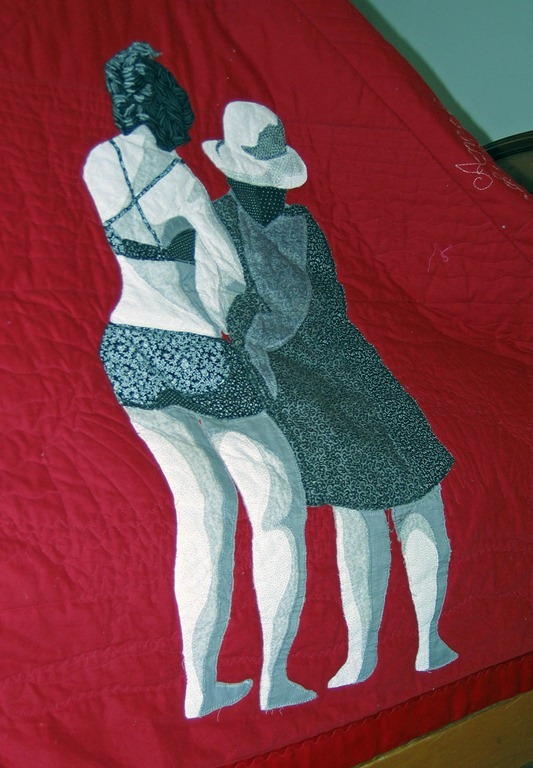 This image was based on a photograph of mother and daughter on a beach. 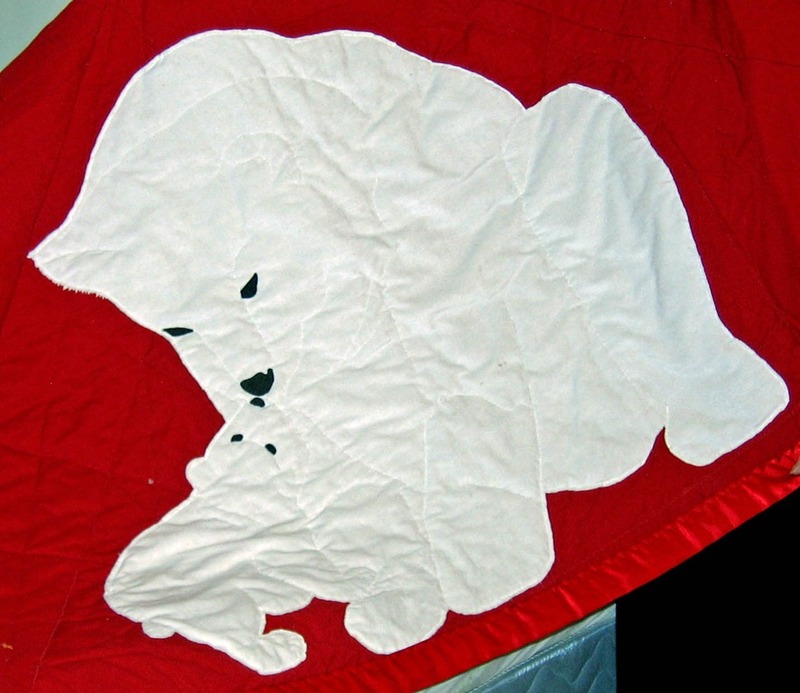 Hannah’s mother loved polar bears, so Hannah wanted one on the quilt. Deb added the cub, much to Hannah’s delight. The bears are a light-weight velvety velour, as best Deb and I can describe the fabric. 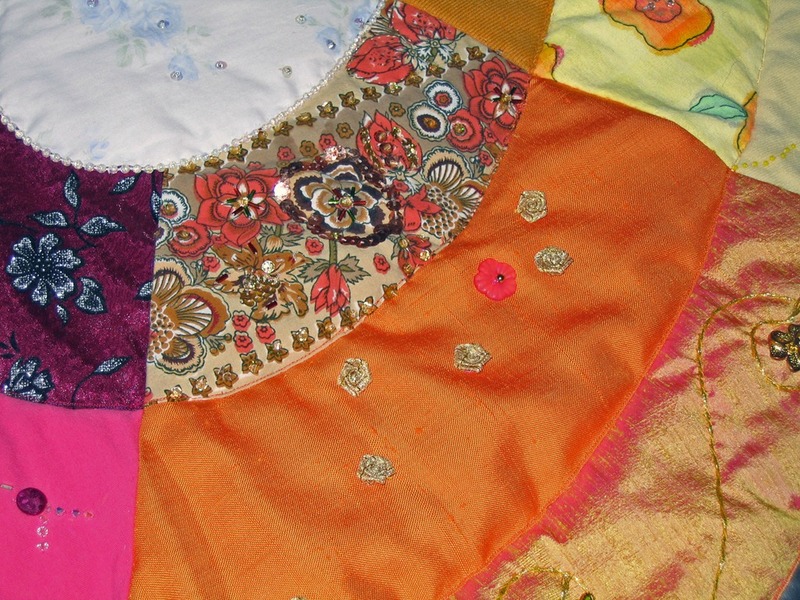 The fabrics are embellished with buttons from the clothing, with other ornamentation from the clothing such as lace, with charms and pins of special meaning, and with beads and Swarovski crystals. Some details follow. This shoe pin was one of several that Deb and her DIL exchanged with each other. 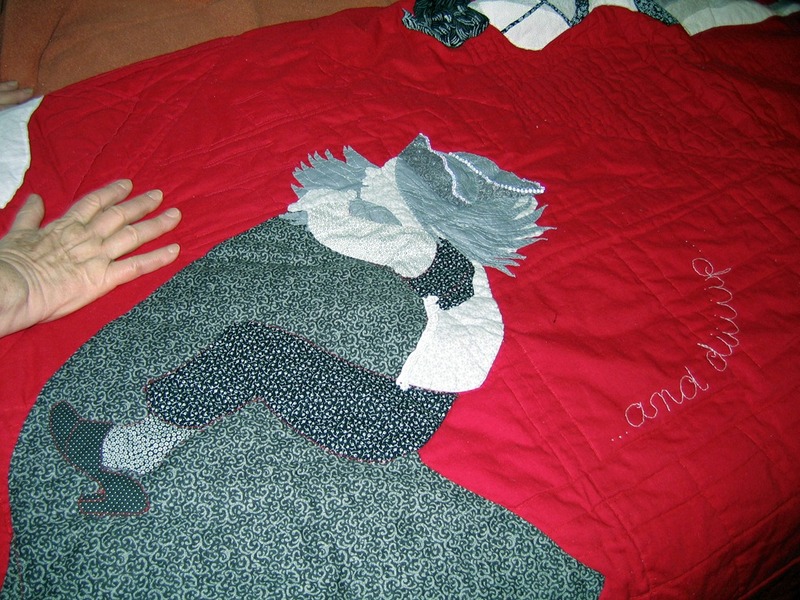 The image on the other side of the quilt was cut from the DIL’s t-shirt. A nurse, she admired midwives and this image celebrates midwifery. 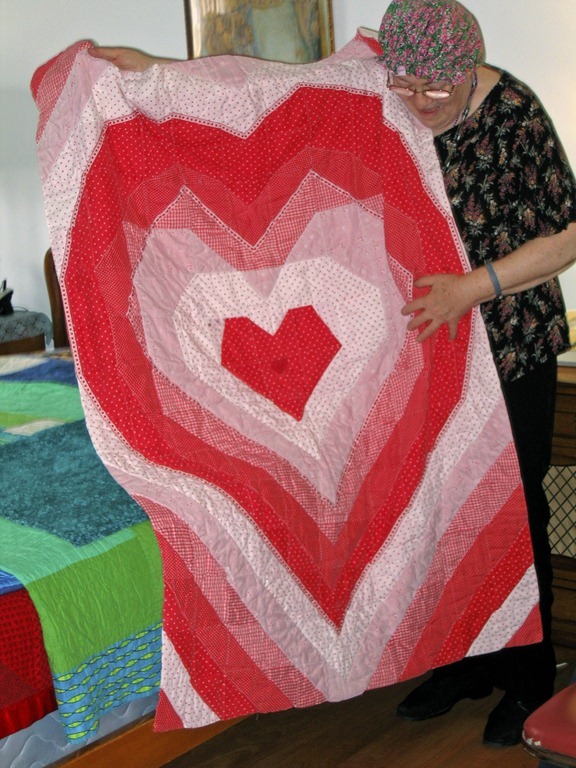 Although Deb didn’t intentionally do this, the concentric hearts design reflects back to the heart crib quilt at the beginning of this show. 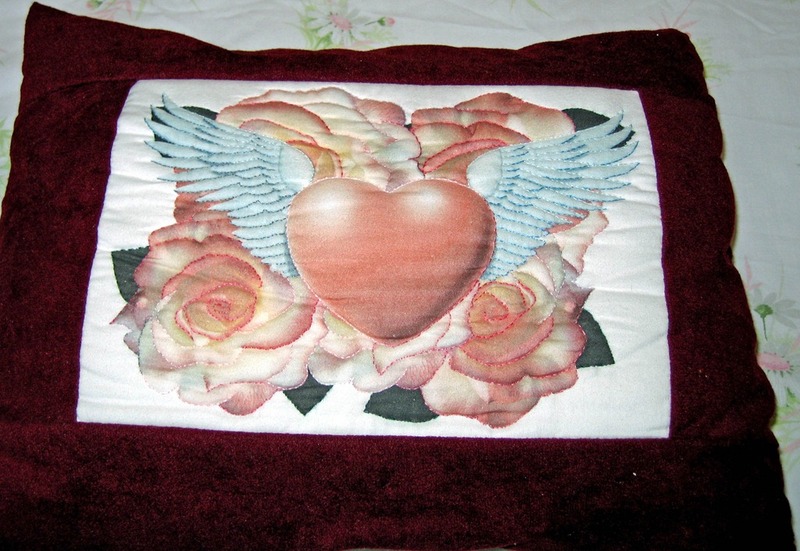 Deb makes things other than quilts. 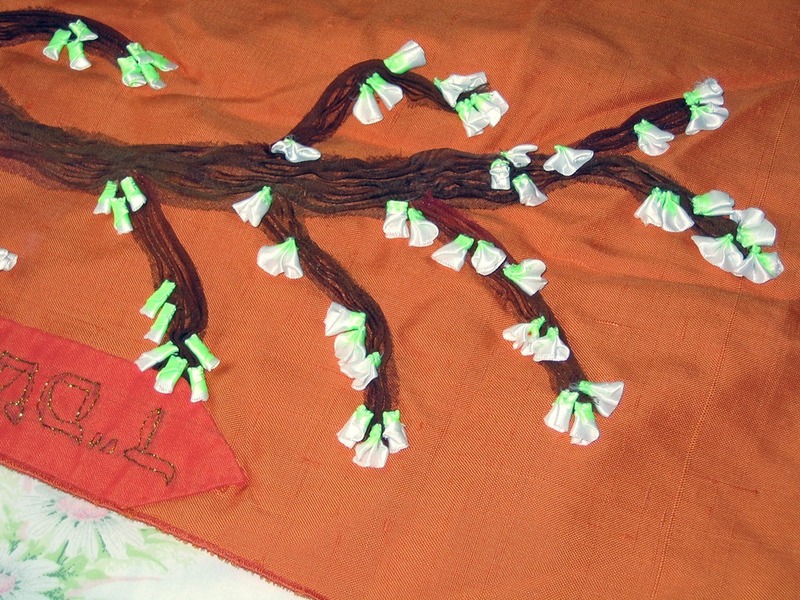 For her bat mitzvah Hannah asked her grandmother to make her a prayer shawl, a talles. 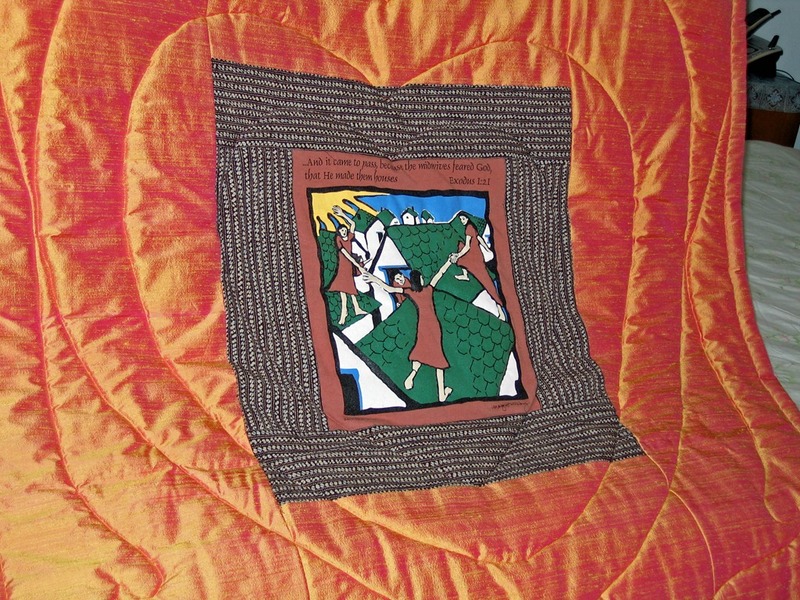 As with the memorial quilt, Hannah knew what she wanted on her talles—the Biblical story of Miriam, Moses’ sister, who saved his life. 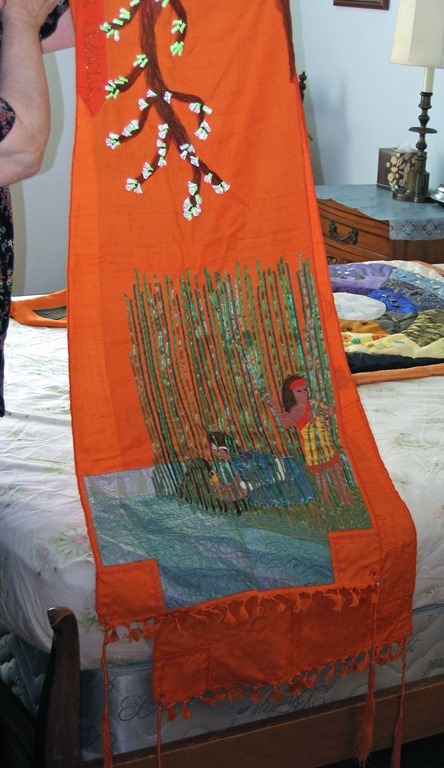 On one end of the shawl, Deb created the scene of Miriam placing the infant Moses in an ark among the bullrushes where the Egyptian princess bathed. The bullrushes are silk ribbons. On the other end of the talles she created the scene of Miriam and other women singing, dancing, and rejoicing after the princess took Moses to be brought up in the palace. Silk ribbon embroidery, I think. 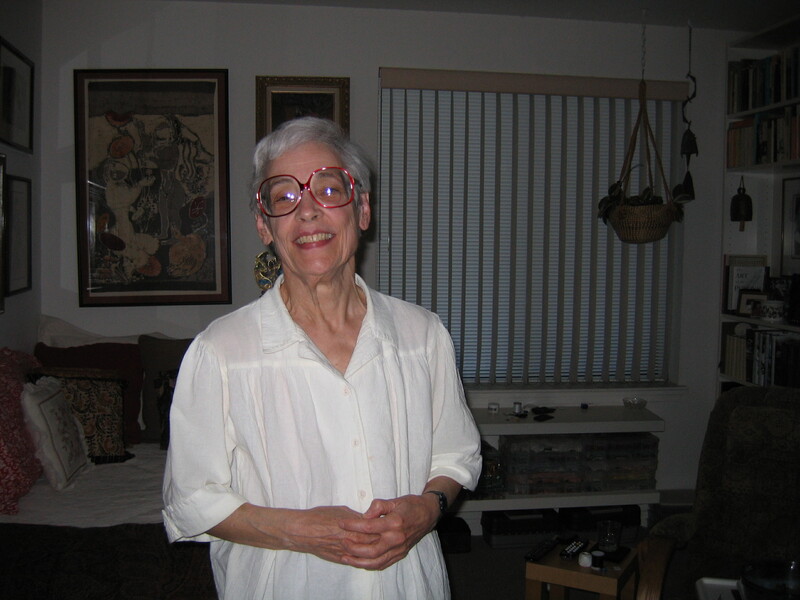 And here is Hannah wearing her talles. Note the opened blossoms on her right. That’s not all. 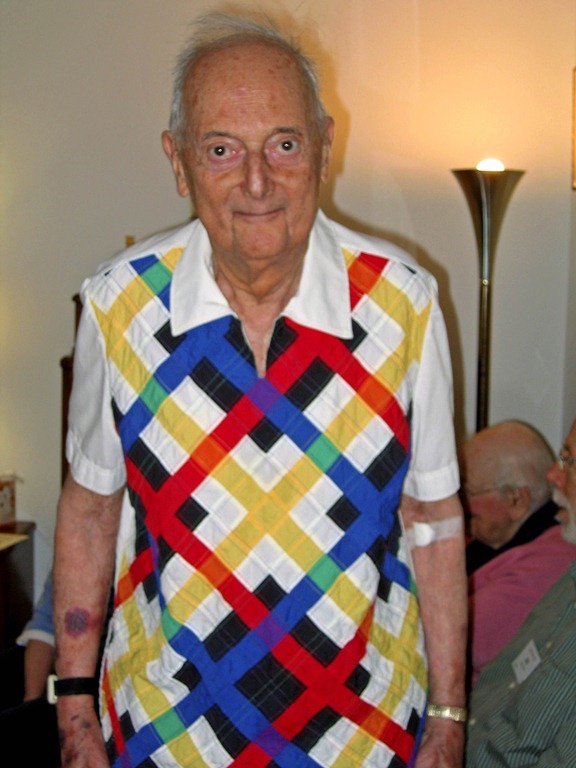 Following is a shot of Deb’s husband, Dr. Phil London, wearing a shirt pieced by Deb. 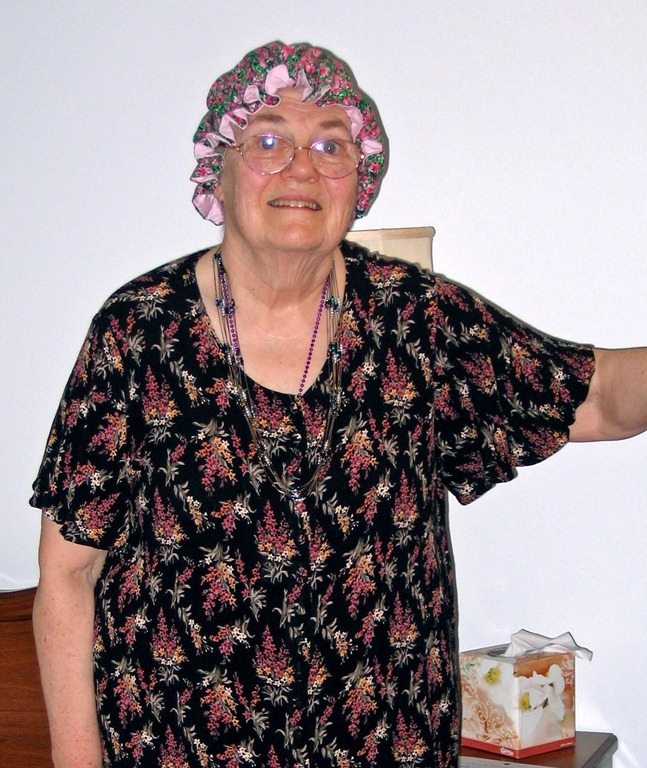 And the artist herself, wearing a mob-cap made by her sister while her hair grows out following chemotherapy. 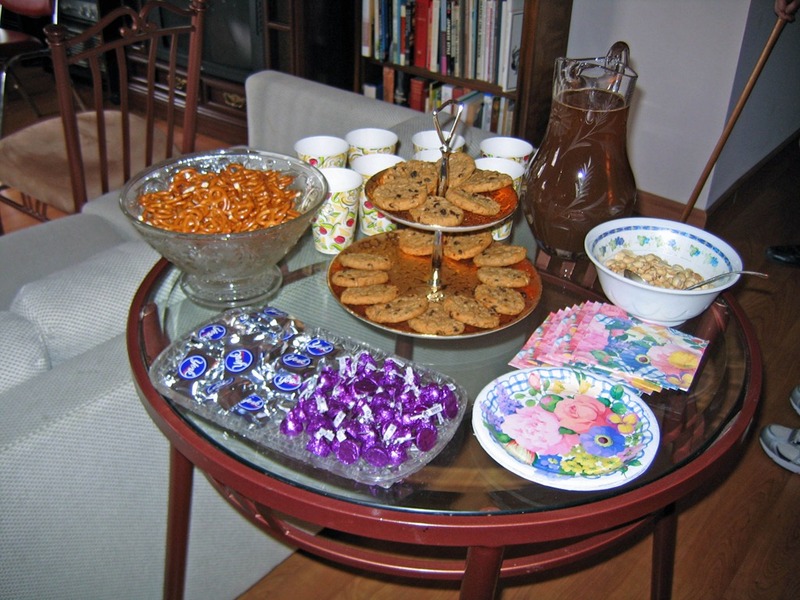 After the show, we enjoyed refreshments and good conversation. My apartment is Parkview 616. Ernie now lives at RGT 227. He’s been there since January 25th. 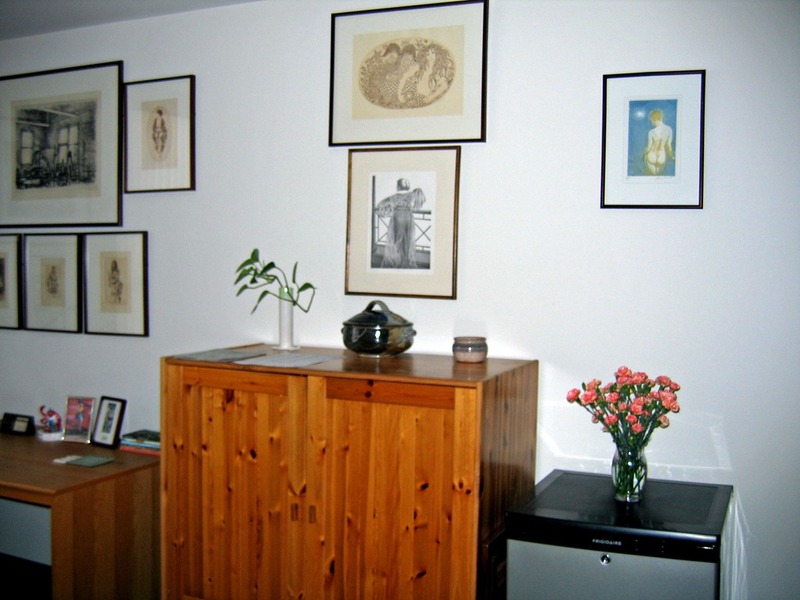 All his furnishings went with him, including his art collection—39 framed pieces, most of which can legitimately be called works of art. 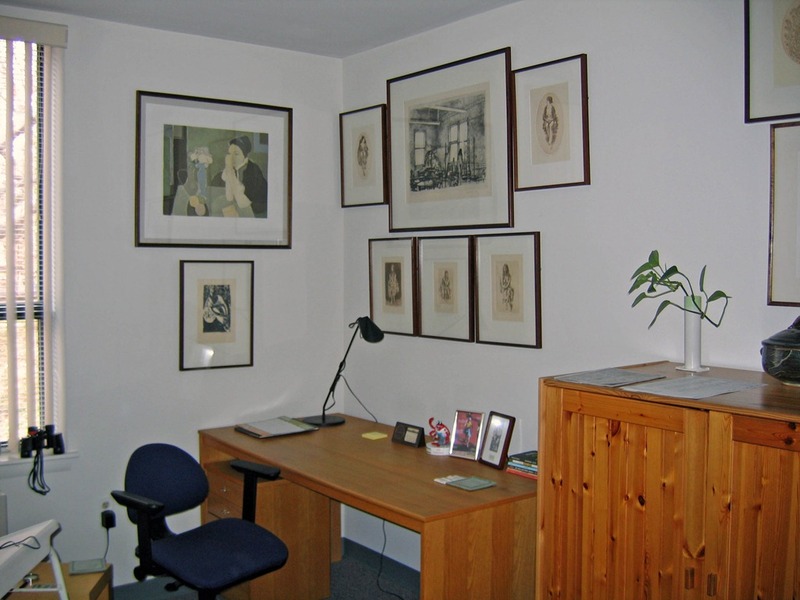 It includes 19 etchings, two lithographs, four serigraphs, 12 color photographs (most of them taken by Ernie), one linocut, and one piece of needlework done by me about 40 years ago. 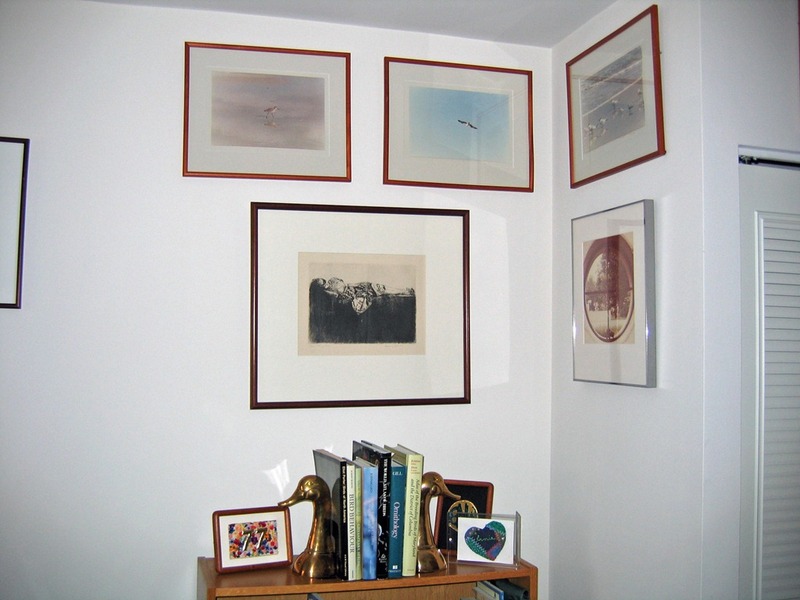 Yesterday son Michael came and hung the pictures. What a huge difference this makes at Ernie’s place. Until yesterday these pictures were stacked in boxes and against the walls. 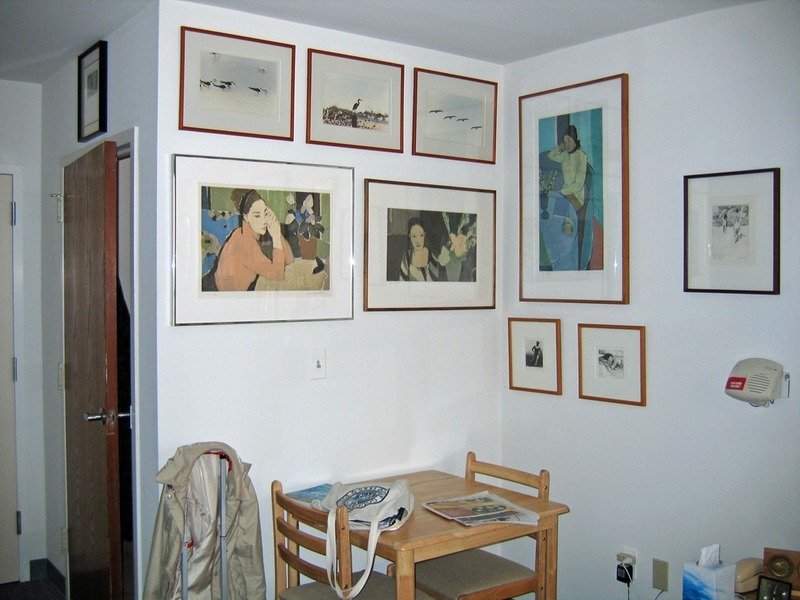 The necessary tools, picture hangers, photographs to show where everything was to be placed, and other odds and ends have cluttered Ernie’s apartment—a state very hard for Ernie to tolerate. Michael efficiently, skillfully, precisely, thoughtfully, and artfully hung those 39 framed pieces. There’s one in the bathroom that I forgot to shoot. 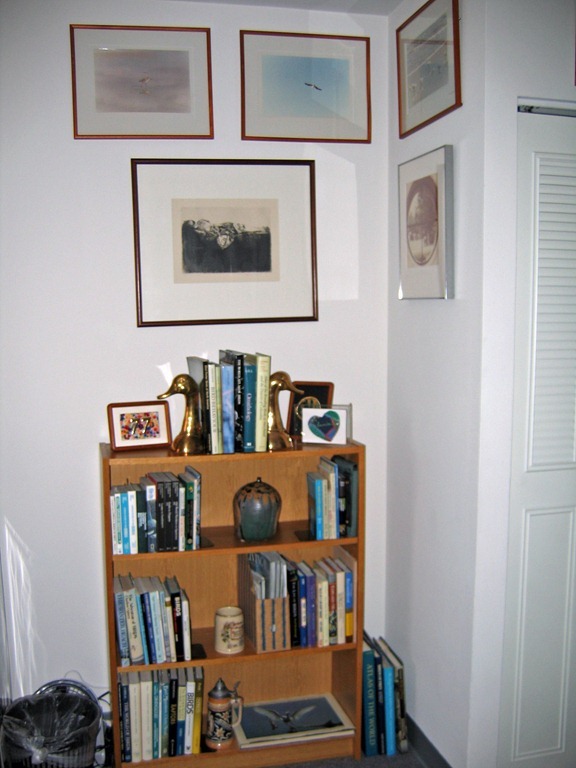 After he left, I cleaned up and organized the place, making it neat and orderly. 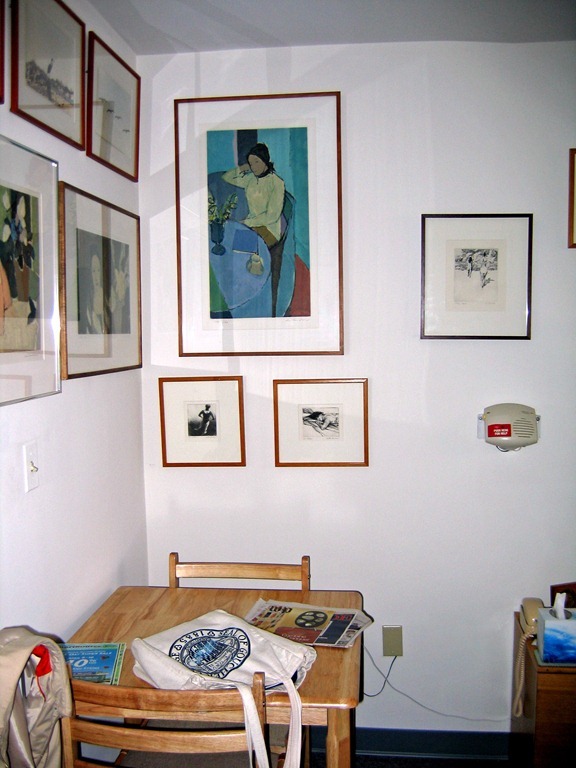 When I returned to Ernie’s “studio” later that afternoon, it was as though I had come from my bedroom into Ernie’s room at Parkview 616. 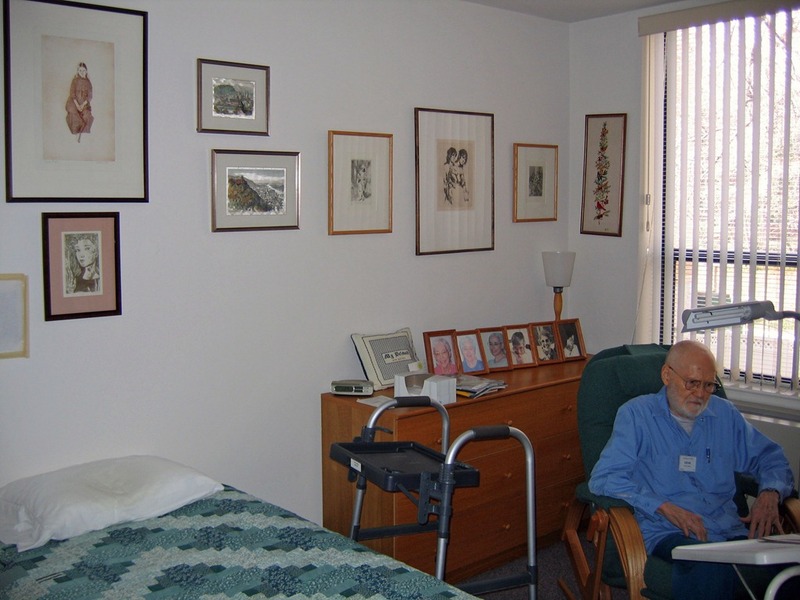 Ernie commented that being able to see his art was a comfort for him. Since January 25th I have been frantically working at making it more comfortable for him at RGT 227—meeting with staff, following up, bringing things, getting things done, and helping him as much as I can to adapt to assisted living. Now, at last, he is comfortable. 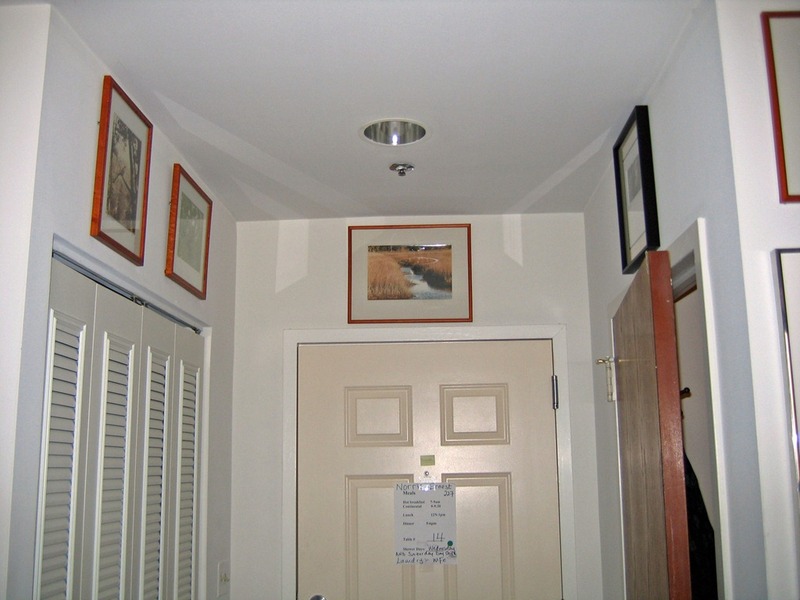 He told me last night that when he returned from dinner and opened his door, he was stunned. He hadn’t been thinking about the difference and coming back into the apartment was “a shock.”. He said he stood there for a long time, looking at everything, enjoying it, enjoying being in his place. Michael spent five hours of his time (including travel) making every hour better for Ernie. And it’s much more pleasant for me to be there, too.